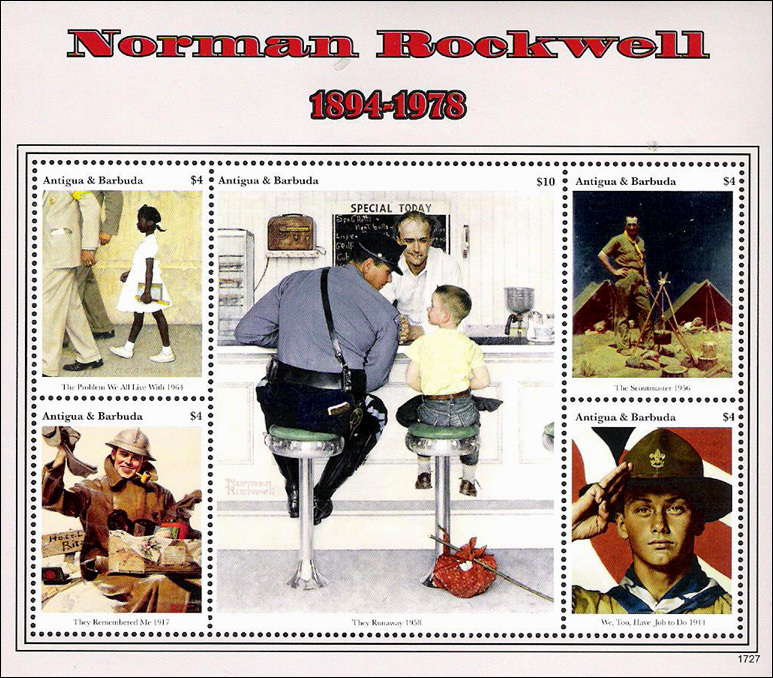 Collectors face the challenge of separating the legitimate postal issues from the illegal, exploitive and/or non-postal offerings. 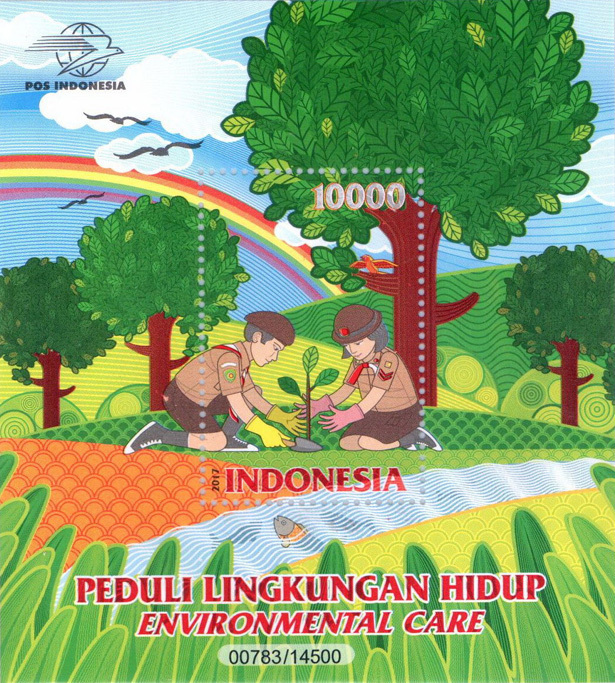 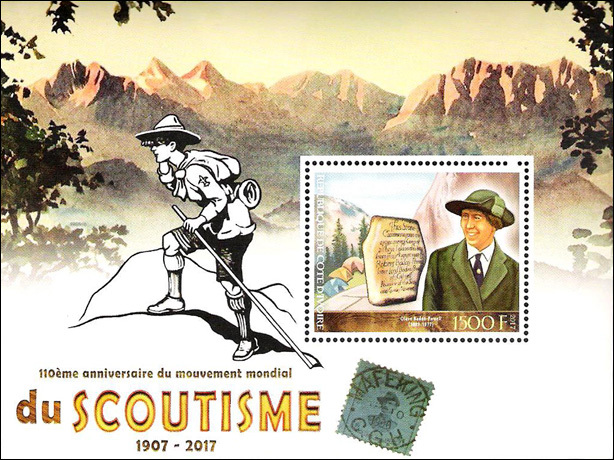 SOSSI has attempted to categorize the various stamp issues according to the IFSCO's (International Federation of Scout and Guide Stamp Collecting Organizations) Classifications of Boy Scout & Girl Scout new postage stamps and postal stationery issues. 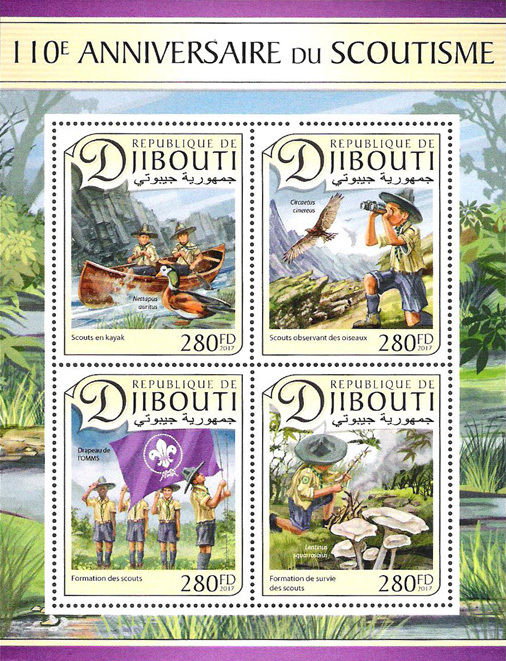 We use information from UPU's World Association for the Development of Philately (WADP) Numbering System - (WNS) and catalogues such as Scotts and Michel. 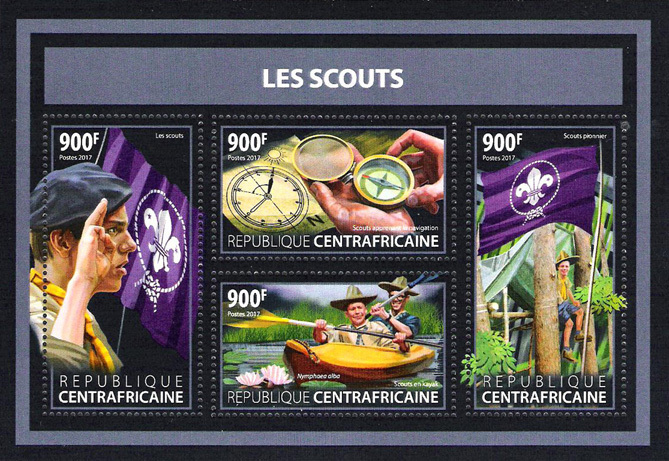 It is ultimately the responsibility of the collector to decide what to add to their collection. 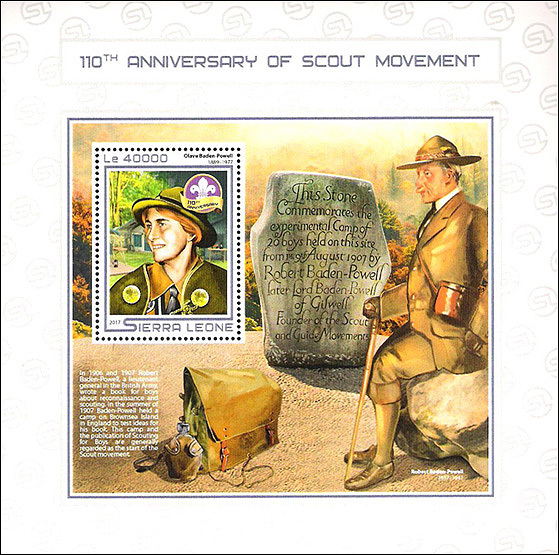 with Boy Scouts of America and Saturday Evening Post covers. 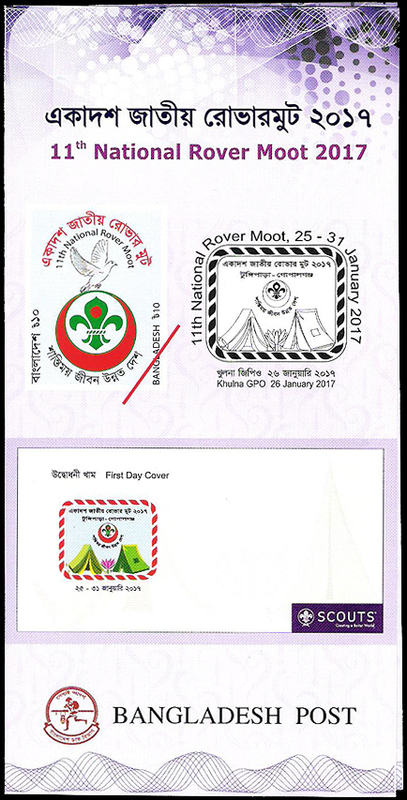 Single printed in sheet of 160 for 11th National Rover Moot ON 25 - 31 January 2017 at Gopalgonj, Bangladesh. 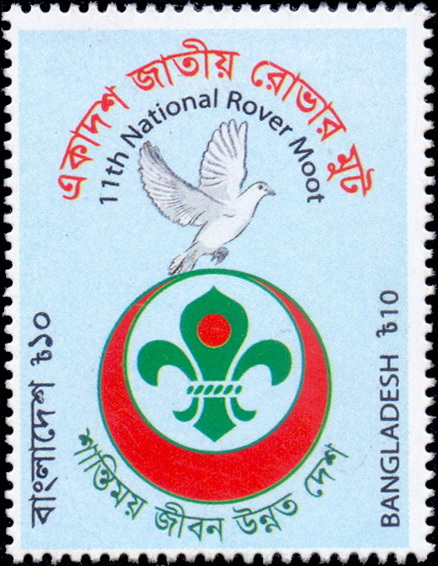 Design features Scout badge and dove of peace. 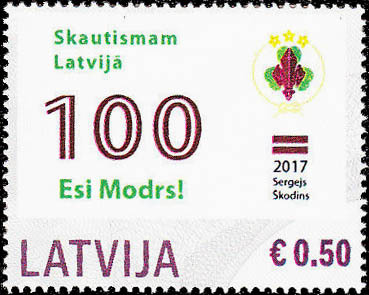 Value - 10 Tk. 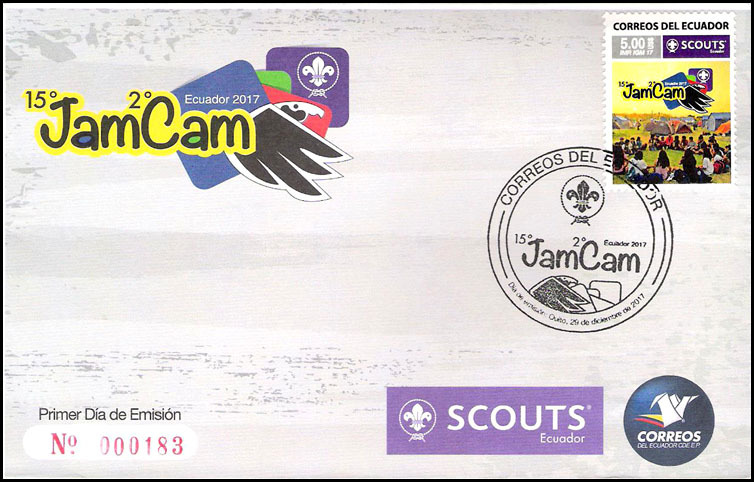 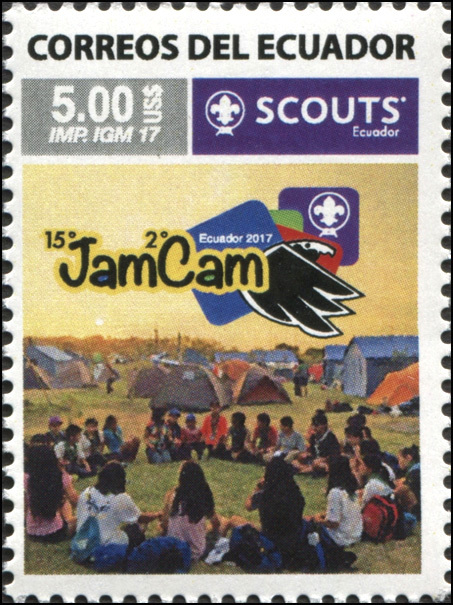 Single issued for JAMCAM 2017, the 15th Interamerican Scout Jamboree and 2nd Interamerican Camporee held from 27 December 2017 - 2 January 2018 at Park "Los Samanes", Quayaquil, Ecuador. 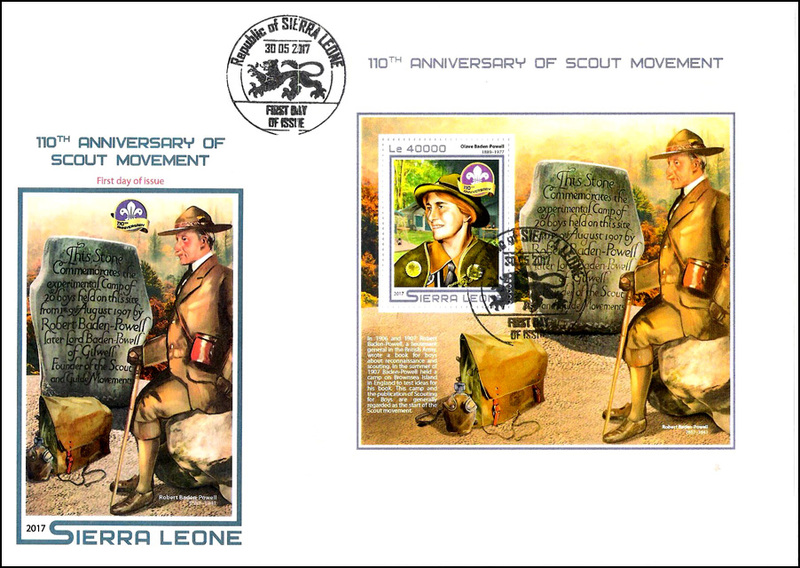 Single showing Cub Scouts meeting and badge for 100th anniversary of Cub Scouting in India and abroad. 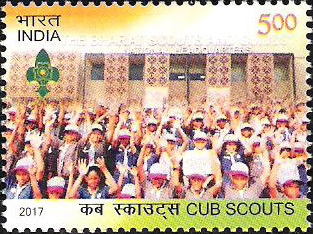 Value - 500 paises; 310,590 stamps printed by wet offset process by Security Printing Press. 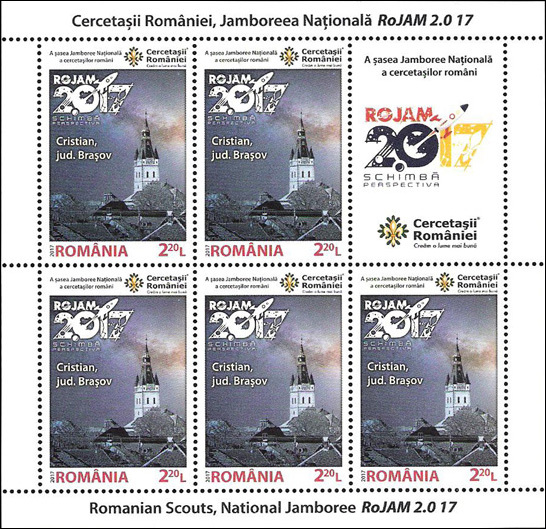 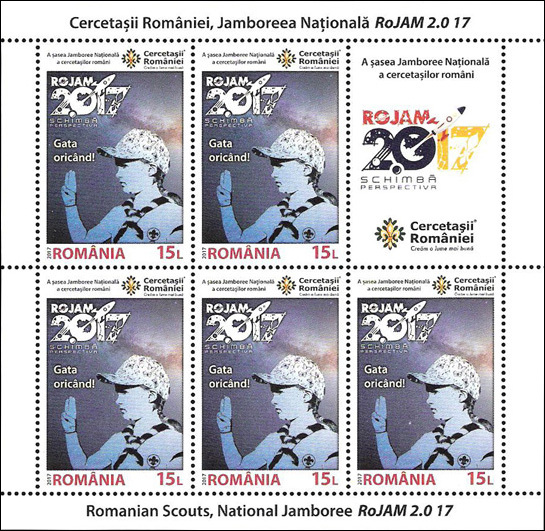 Designer: Helge Denke; 10,000 SSs printed by Lowe Martin Ltd.
Set of 4 printed in 4 sheets of 5 stamps each and one label, ROJAM 2017 on each stamp for the Sixth Romanian Scouts National Jamboree held at Cristian, Brasov, Romania. 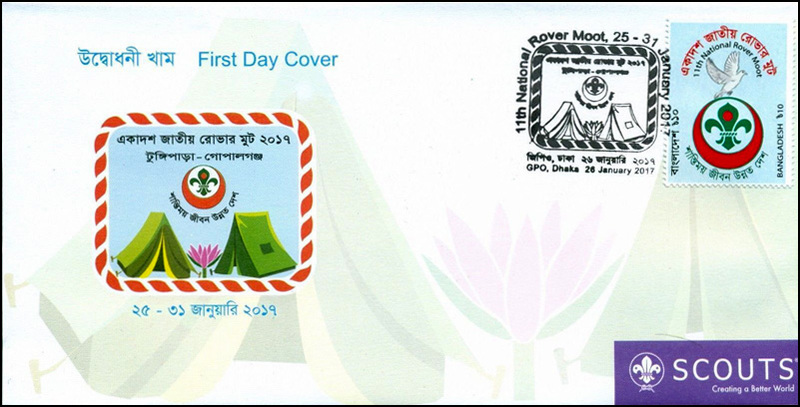 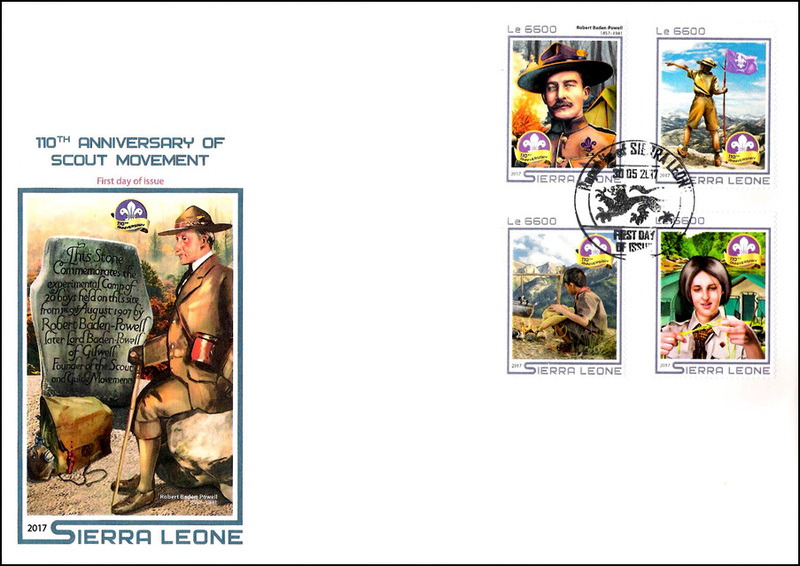 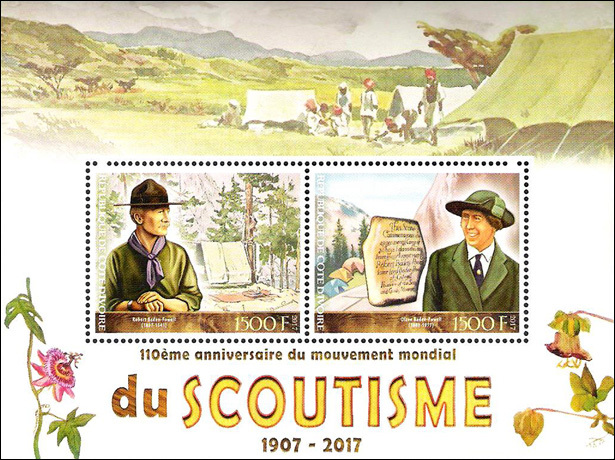 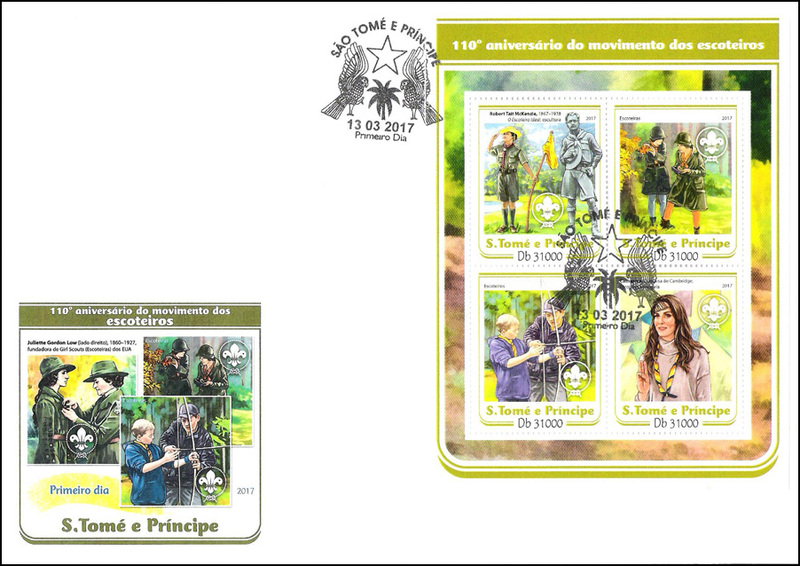 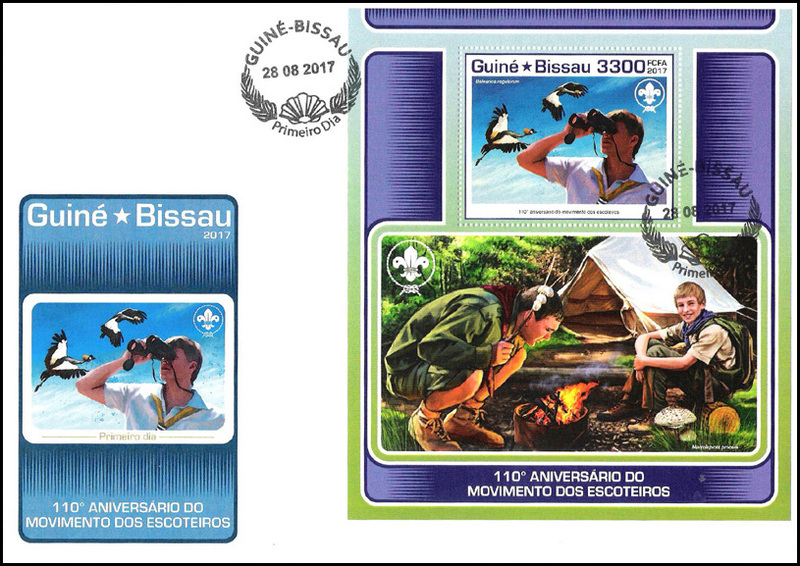 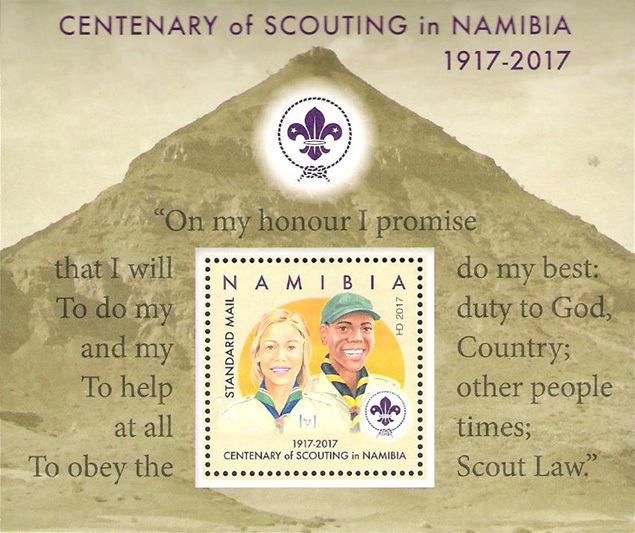 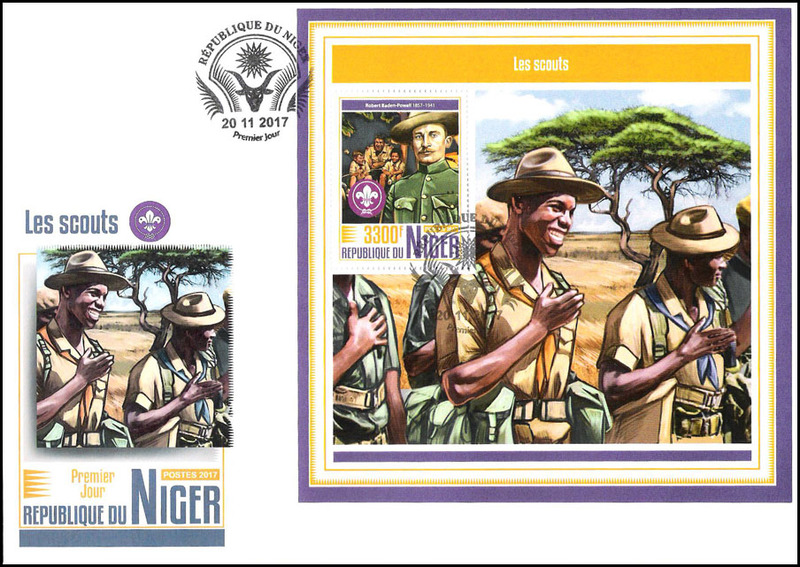 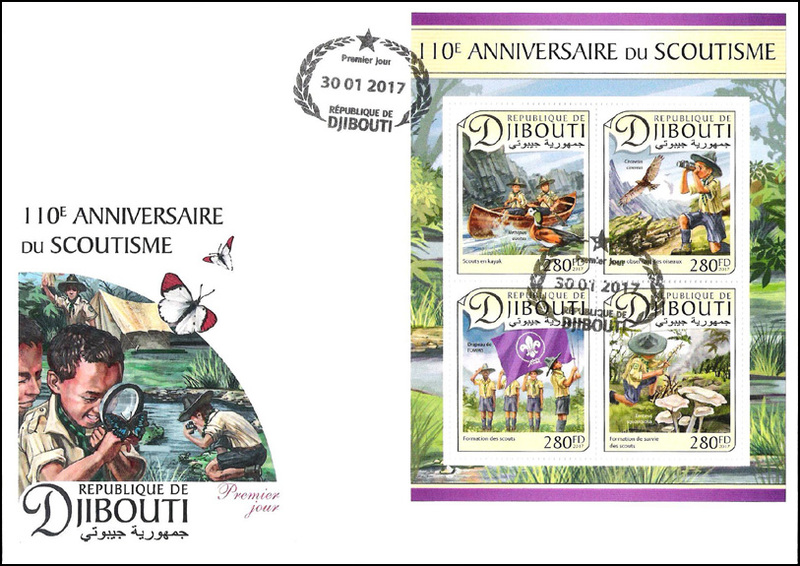 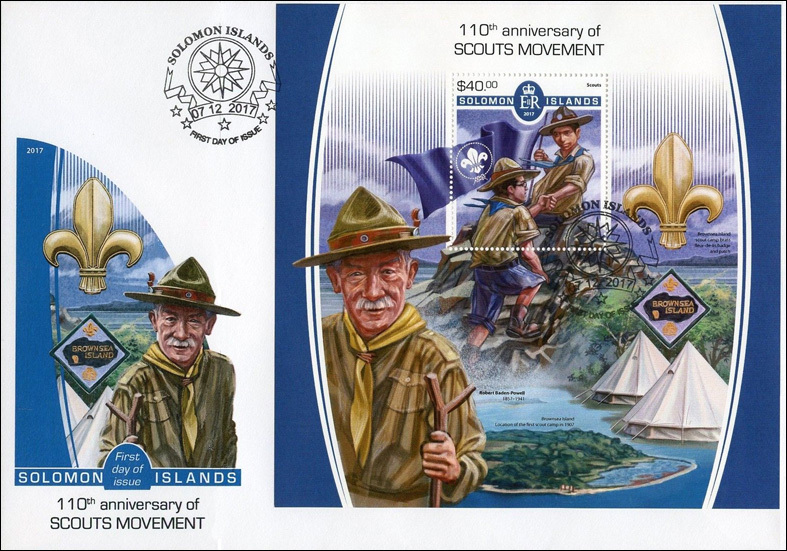 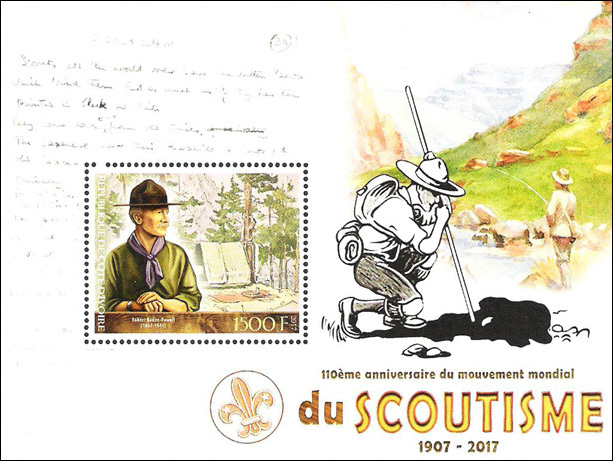 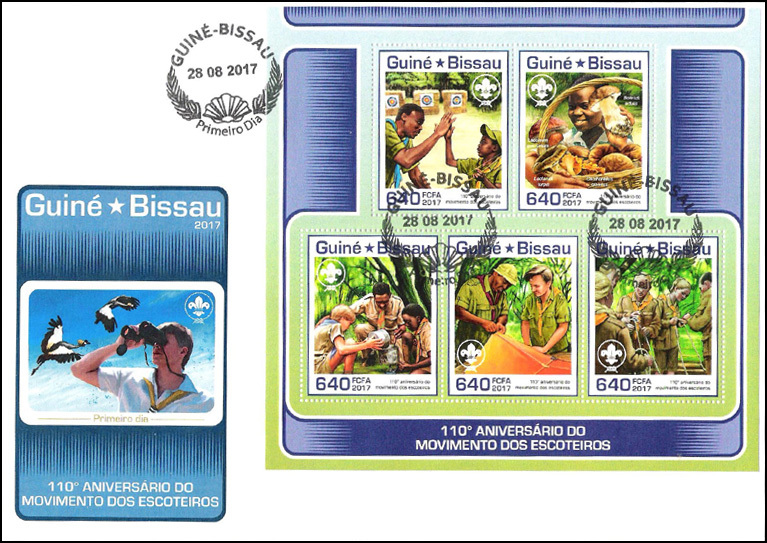 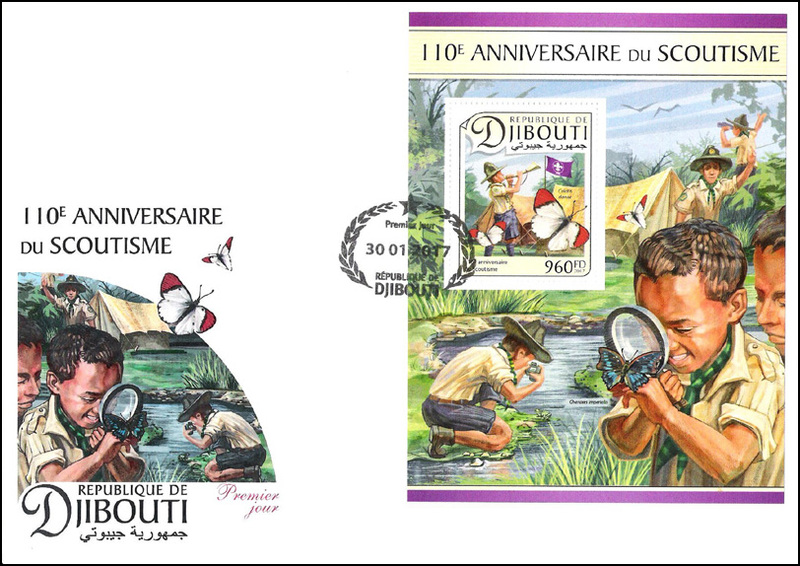 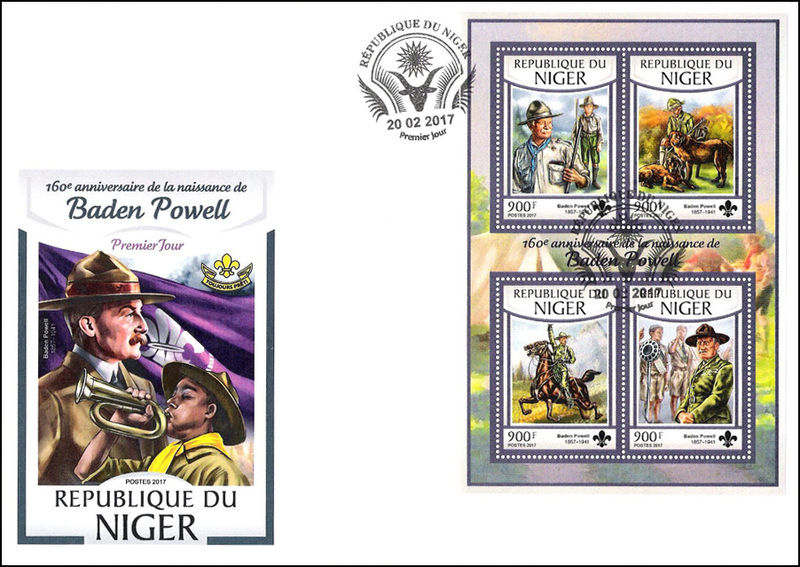 Themes of stamps are view of Cristian, large campsite for A Global Movement, Leader and Scouts - Creating a Better World, and a Scout saluting - Be Prepared (Scout Motto). The ROJAM logo is on all stamps and a label in each sheet. 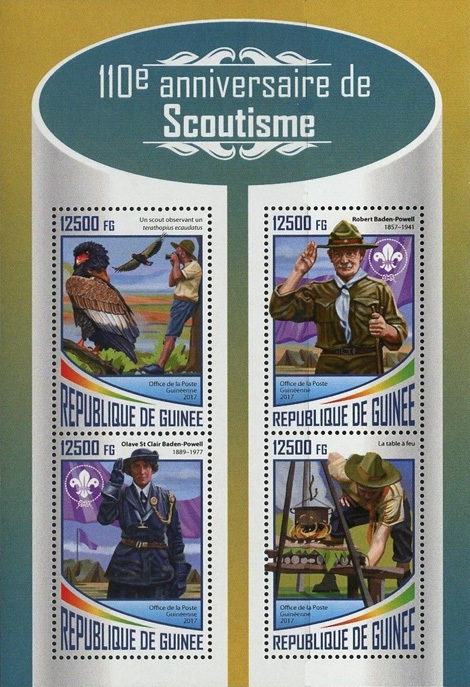 The Girl Guide stamp depicts a girls in uniform with a Girl Guide flag. 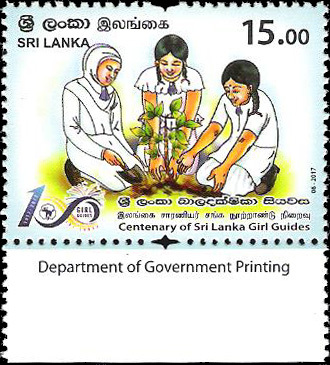 Designer: Alynn Teo; Printed by offset lithography by Secura Singapore Pte Ltd.
Three Girl Guides planting a tree. 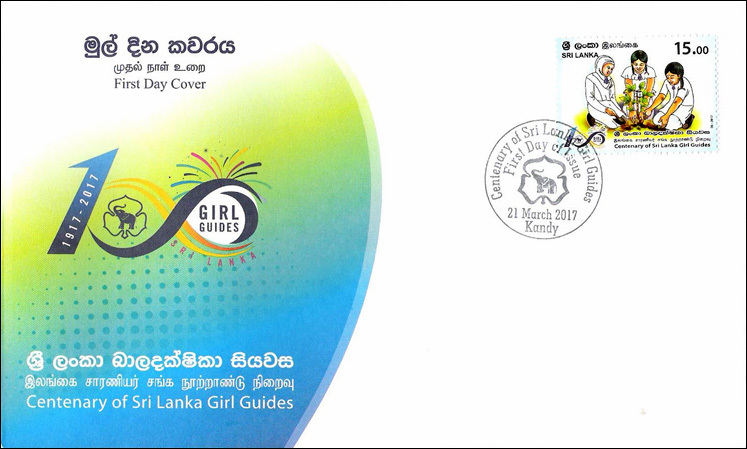 Girl Guiding was introduced to Ceylon (former name of Sri Lanka) by Miss jenny Calverly at the Girls' High School in Kandy in March 2017. 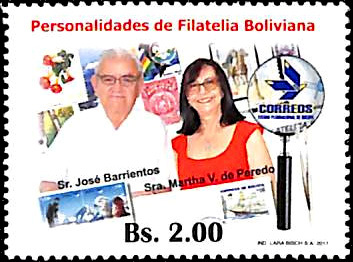 SS issued to commemorate two Bolivian Philatelic Personalities, Sr. Jose Barrientos and Sra. 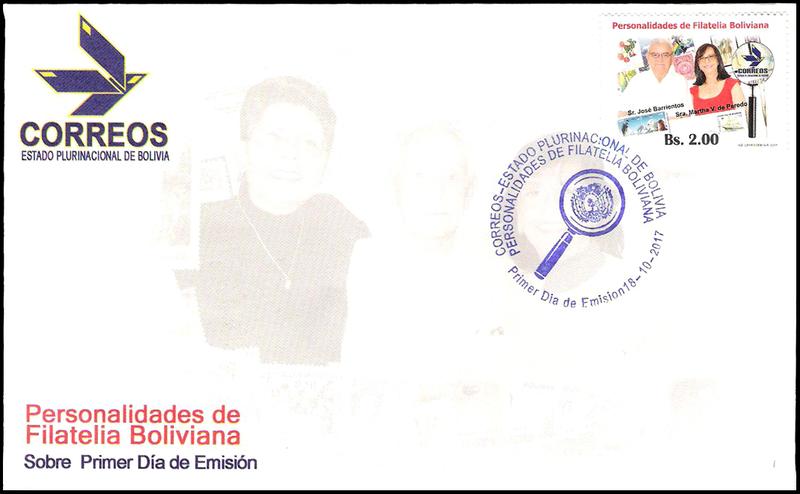 Martha V. de Peredo. 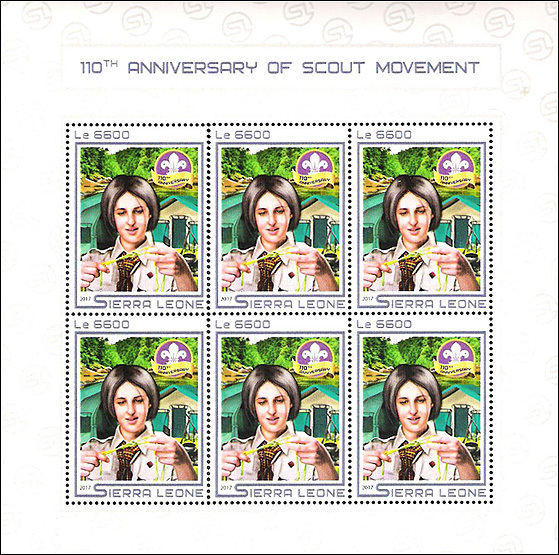 Above & to right of Sr. Barrientos' head is partial image of 1994 Bolivian Scout stamp, "Jamboree americano." Value - 2.00 Bs. 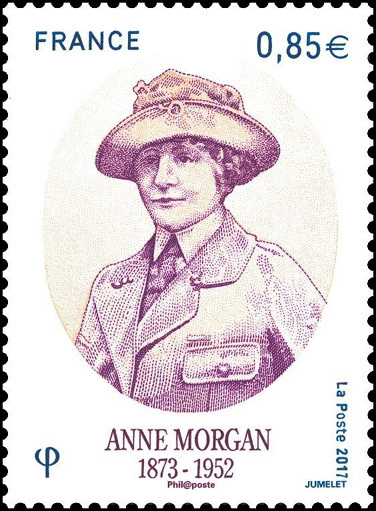 Single honoring Anne Tracy Morgan (1873 - 1952), American philanthropist and humanitarian who provided relief efforts and aid to war-torn areas of France during and after WWI. 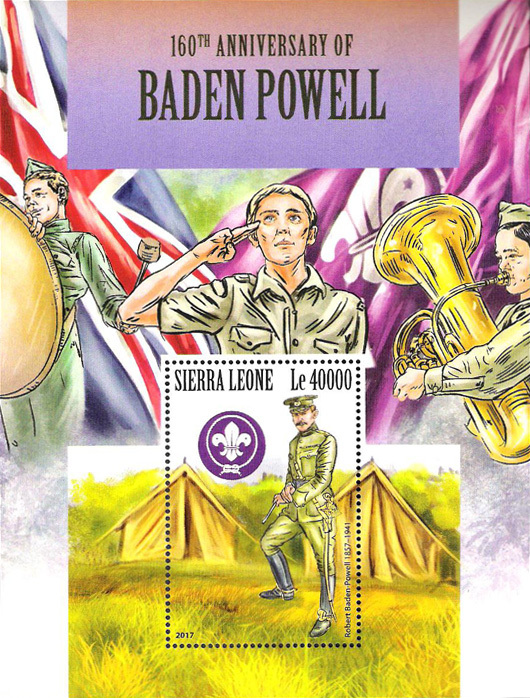 She was instrumental in restoring Scouting to these areas after the war. 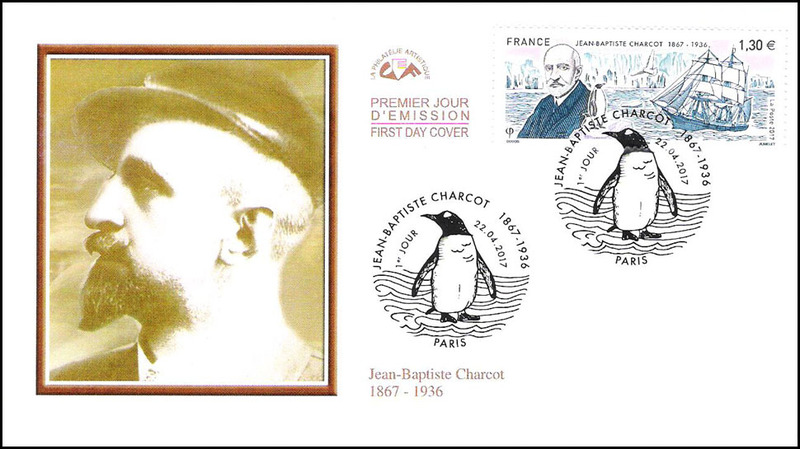 Single stamp issued for 150th birthday of Charcot, French scientist, medical doctor an polar explorer, with ship, penguin and gull. 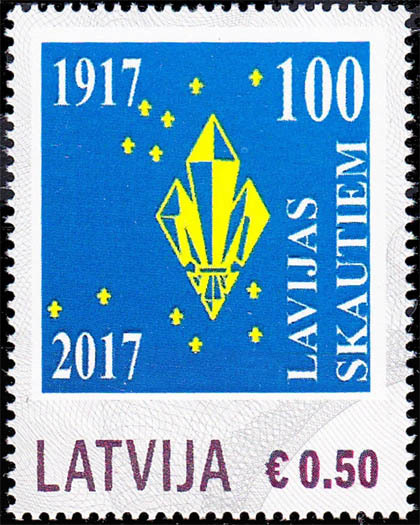 Value - 1.3 Euro. 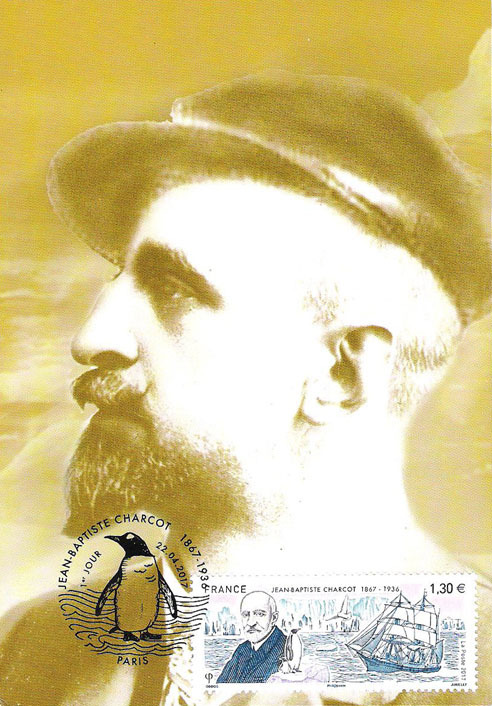 Charcot was one of founders of Eclaireurs de France in 1911 and was their president (1911 - 1925). 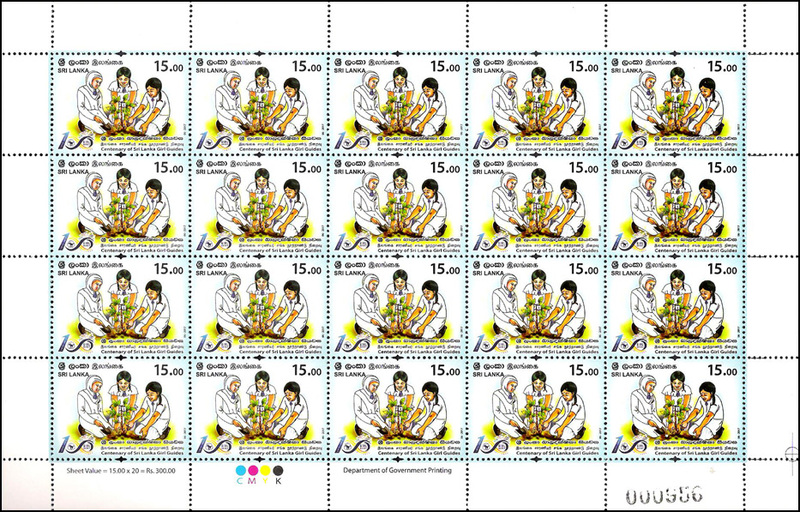 Stamp issued in sheets of 9. 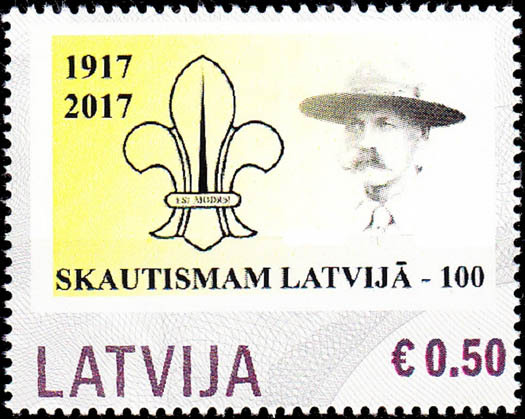 Mariusza Zariuskiego served in Cavalry in and after World War I and retired as a Brigadier General. 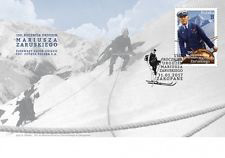 He was a pioneer in Polish sports yachting and a noted mountain climber and rescuer. 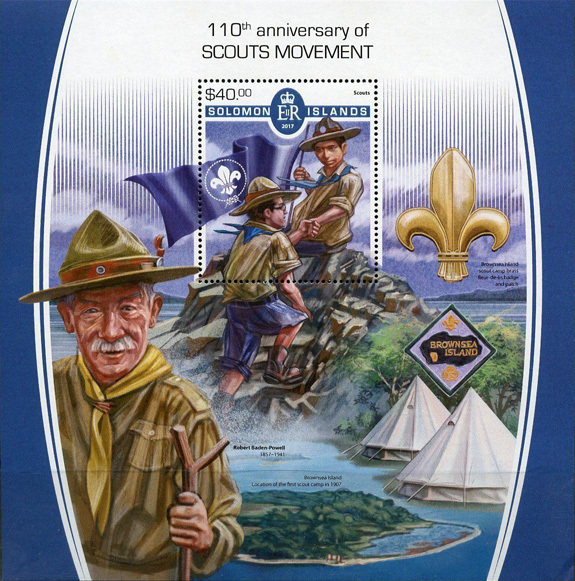 He was an instructor in seamanship for Sea Scouts in the 1930s and a leader in Scouting for many years. 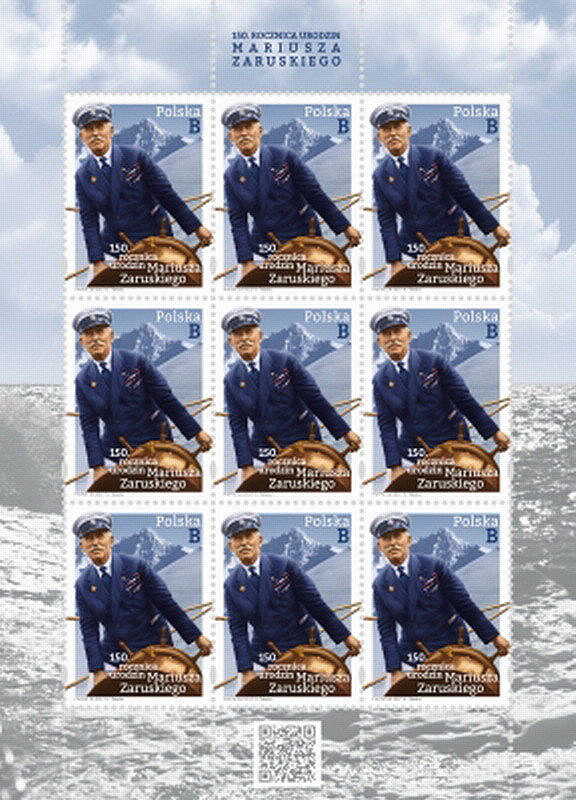 He was captain of the schooner Zawisza Czarny from 1935 - 1939. 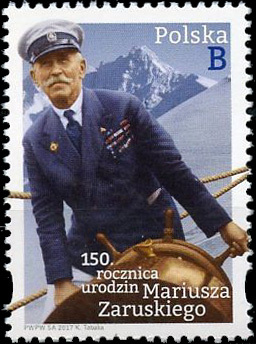 A current yacht owned by Polish Scouts also is named Zawisza Czarny. 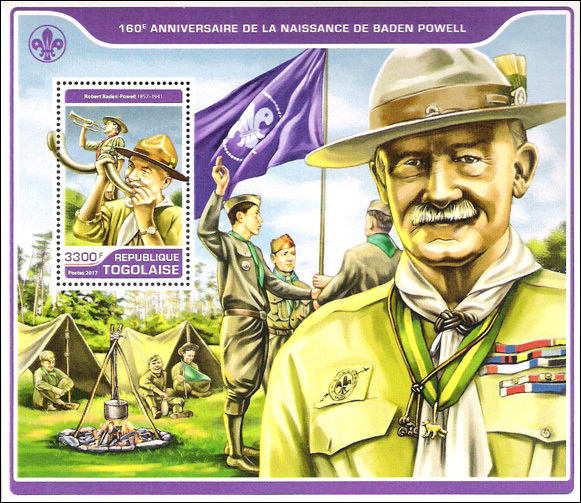 He was imprisoned by the Russians in 1939 and died in a prison camp in 1941. 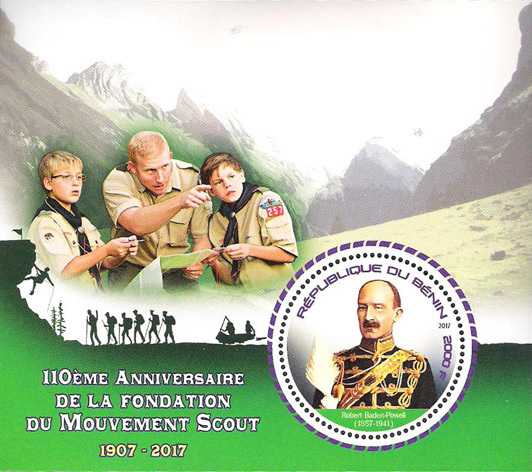 The Polish Boy Scouts arranged to have his ashes returned to Poland in 1991 and buried at Zakopane. 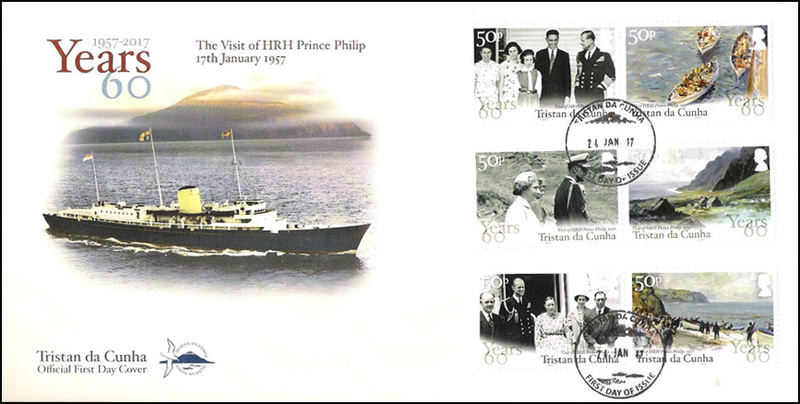 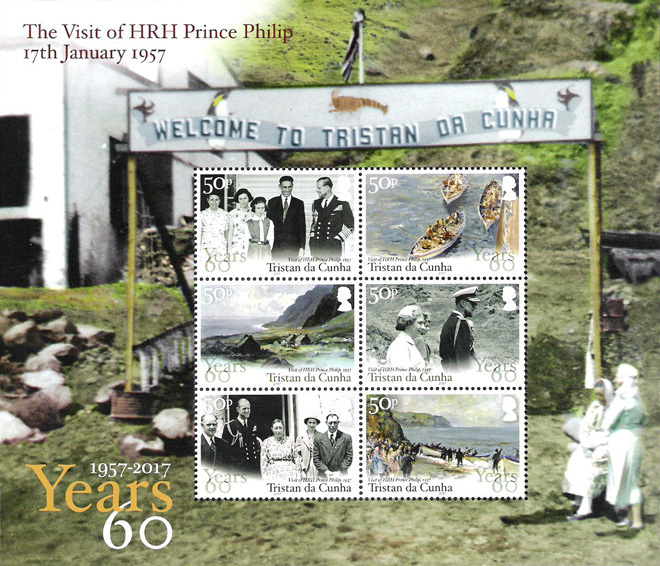 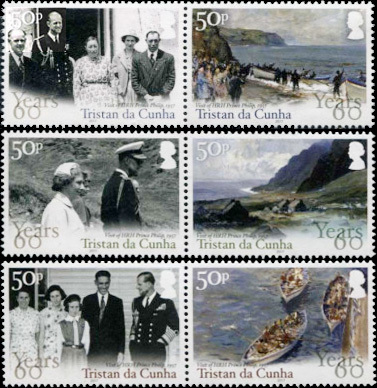 SS: Same 3 se tenant pairs with Welcome to Tristan da Cunha in margin. 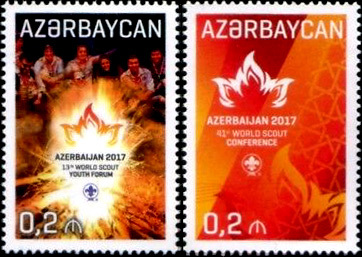 MS of 3 and SS (Perf & imperf). 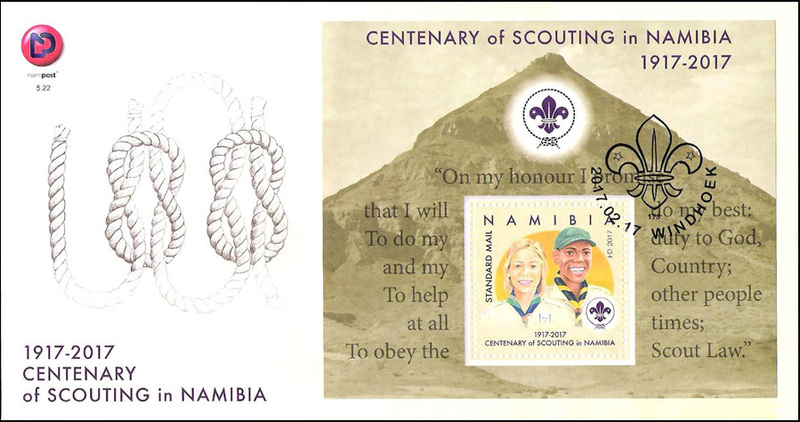 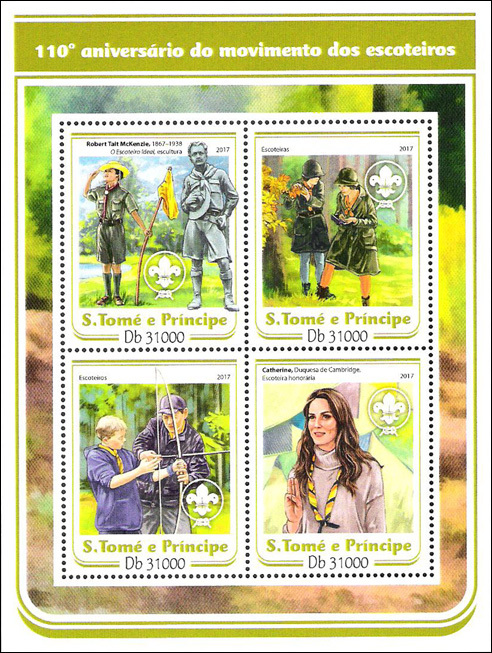 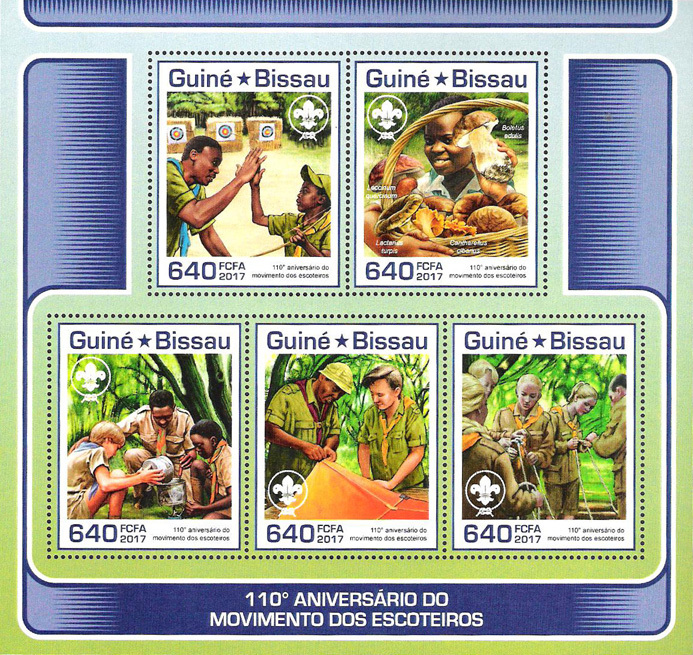 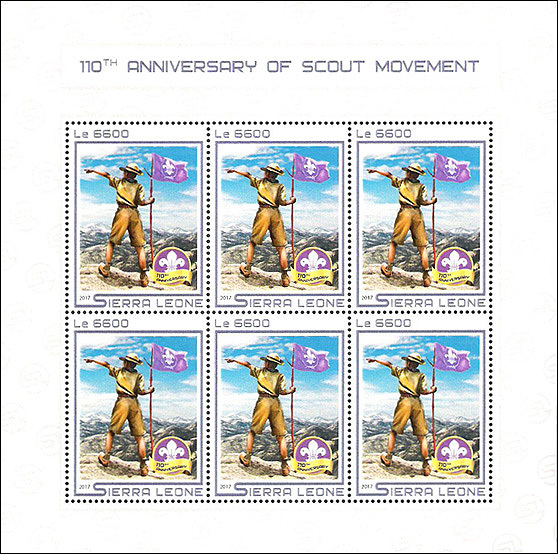 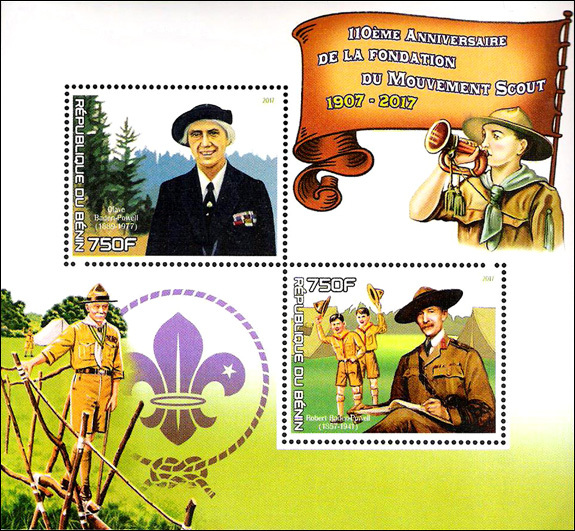 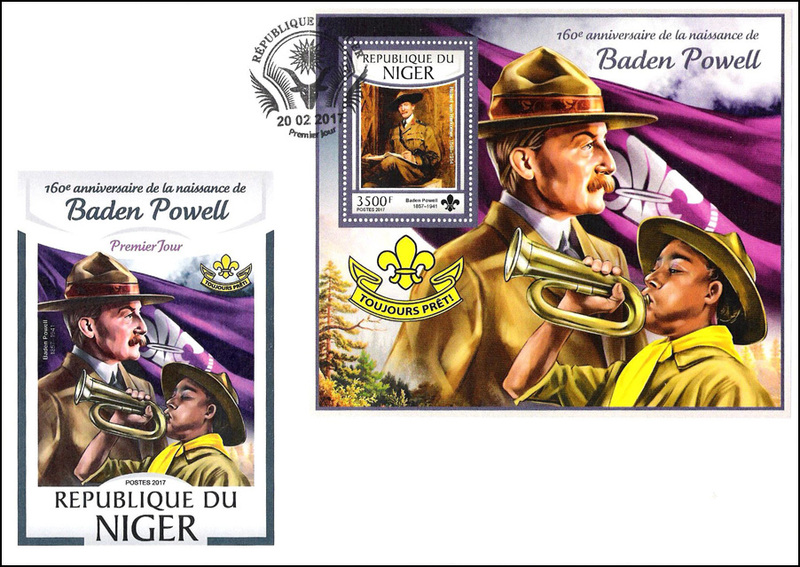 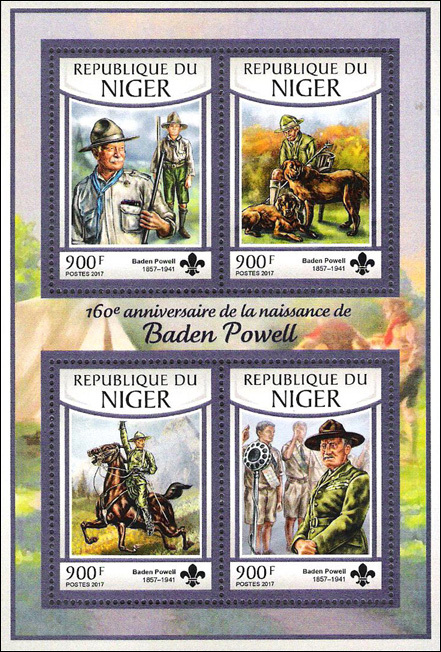 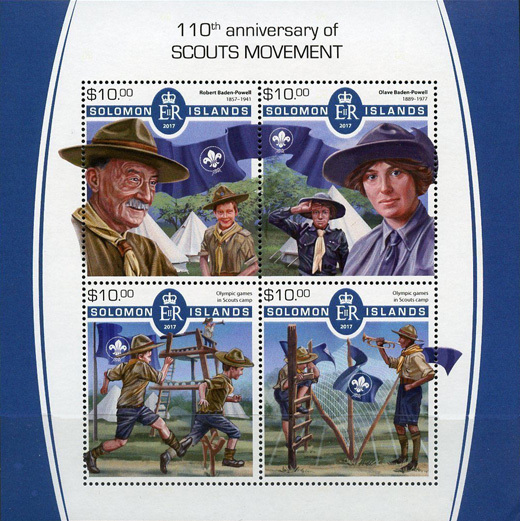 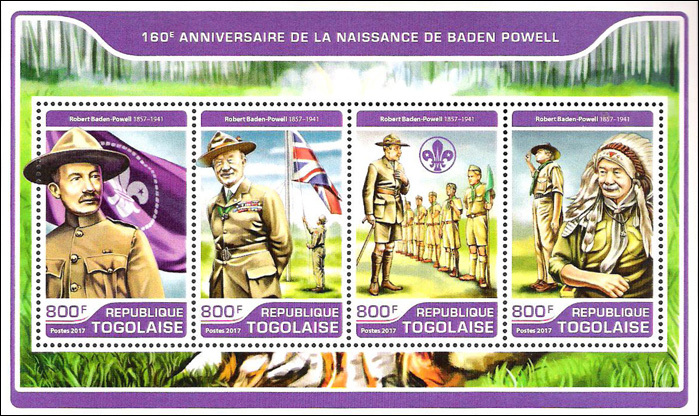 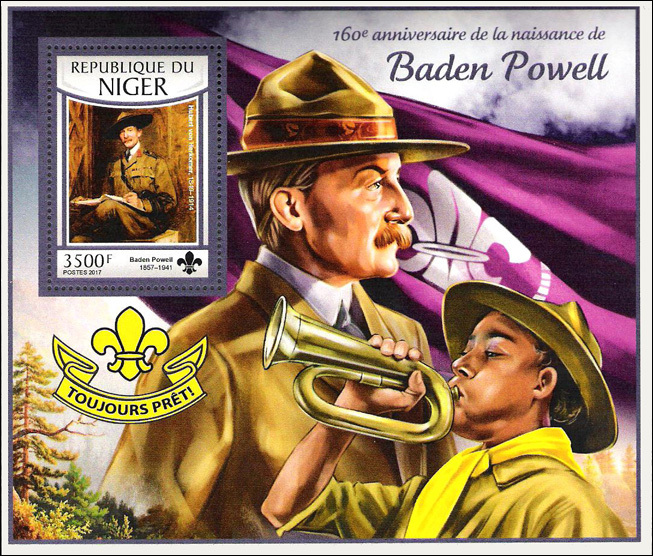 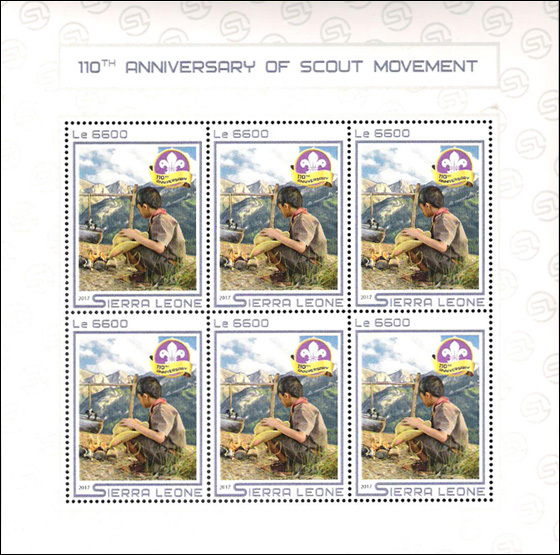 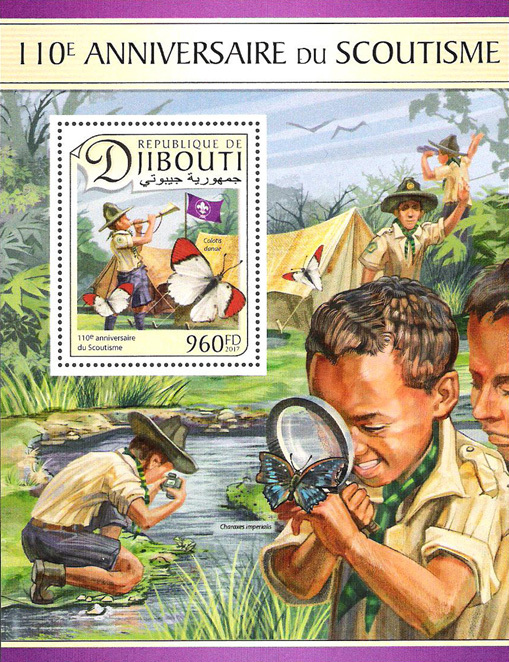 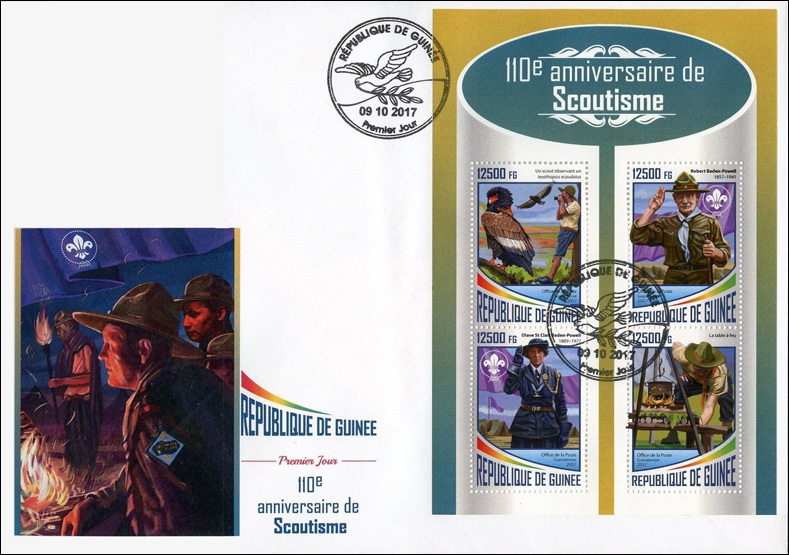 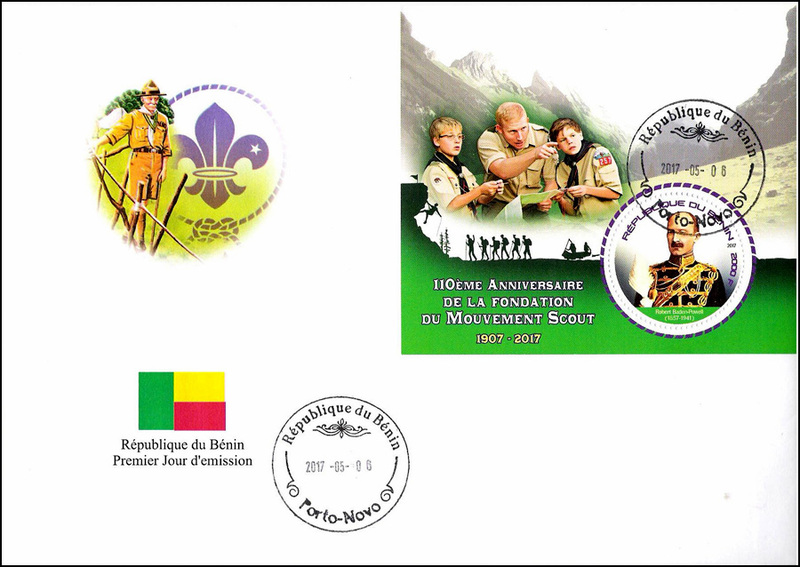 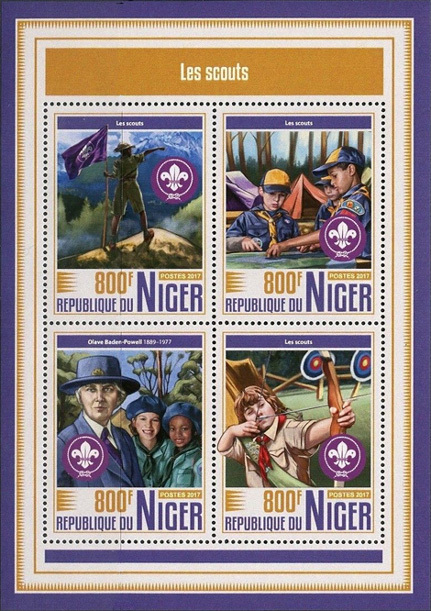 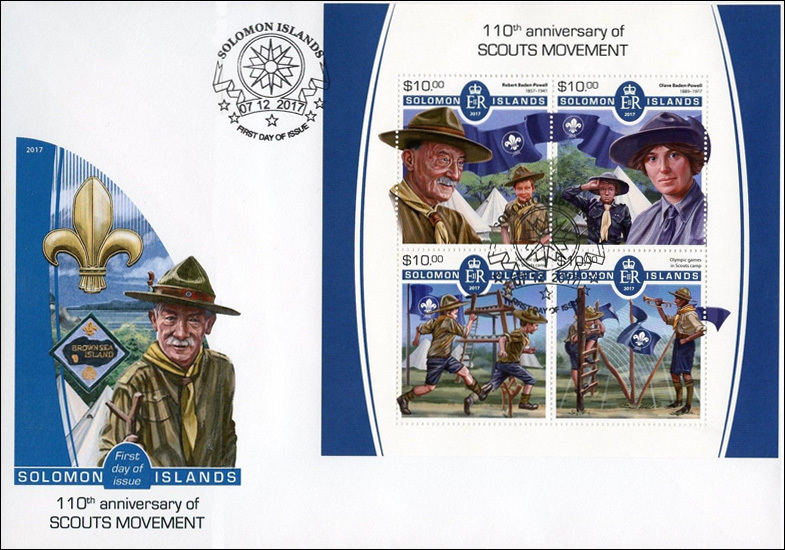 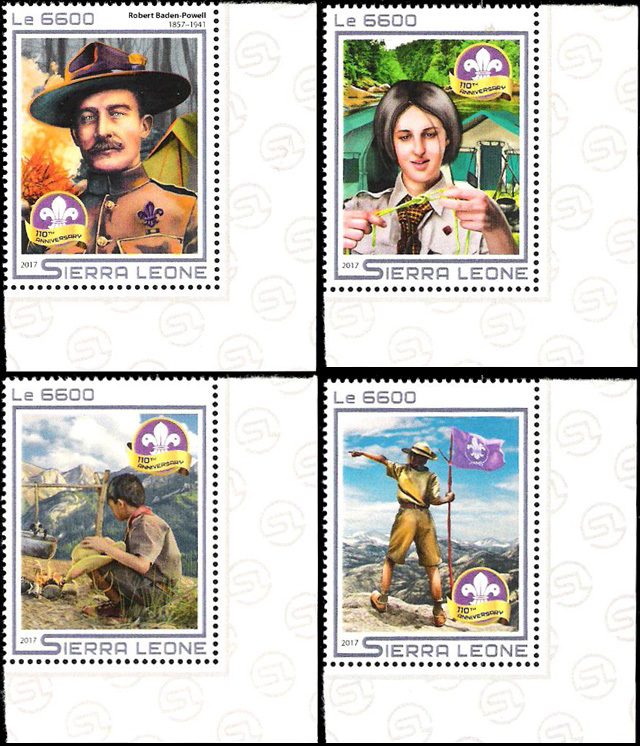 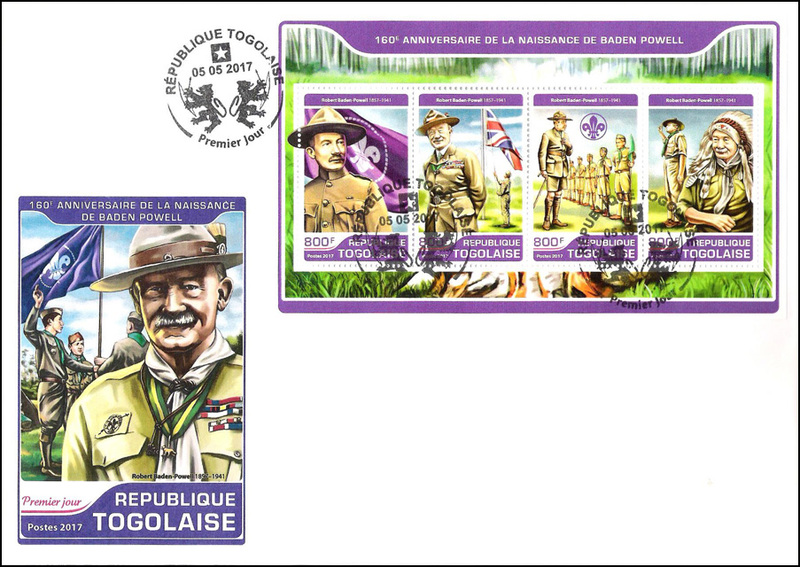 The MS and the SS all have identical stamps depicting B-P with Scouts with background of World Scout badge. 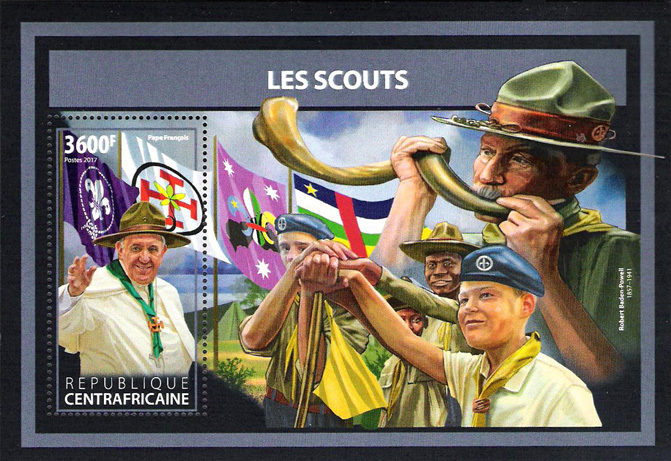 The SS also shows three Scouts and B-P blowing kudu horn. 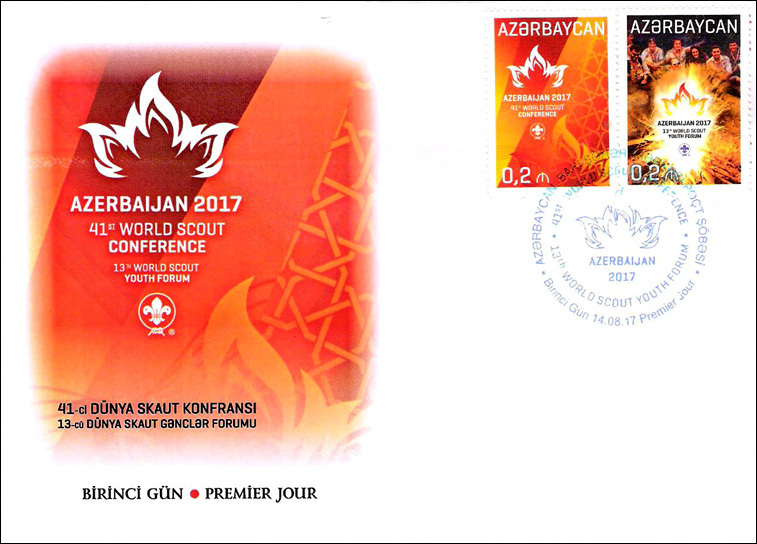 World Scout flag in MS and SS. 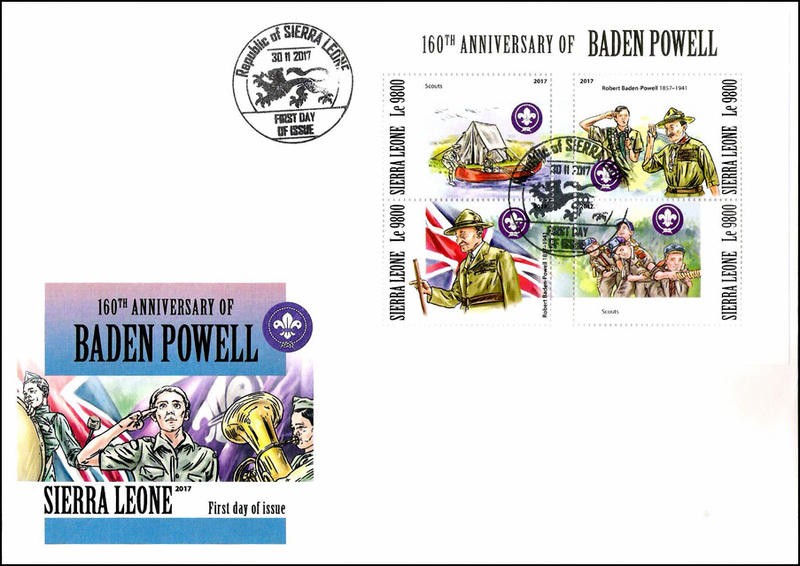 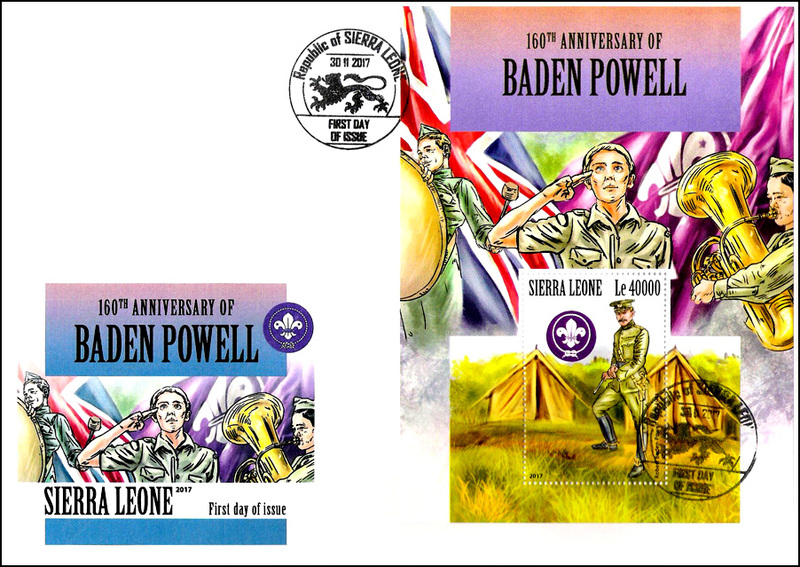 MS of 2 and 2 SSs (perf & imperf) featuring Lord and Lady Baden-Powell. 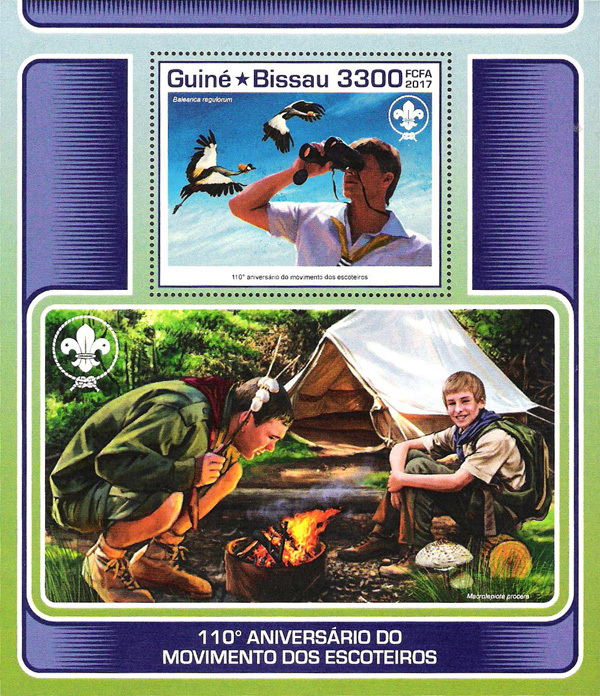 They are together on MS and are depicted separately on SSs. 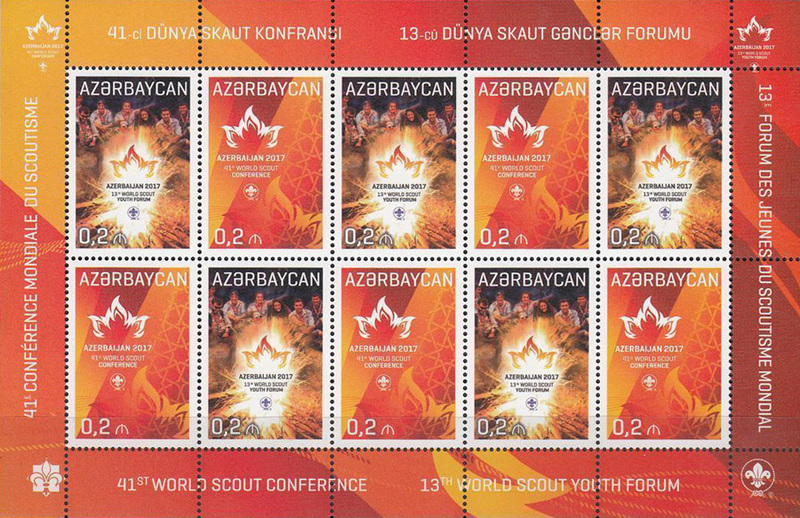 Value - 1500 F on stamps on both MS and SSs. 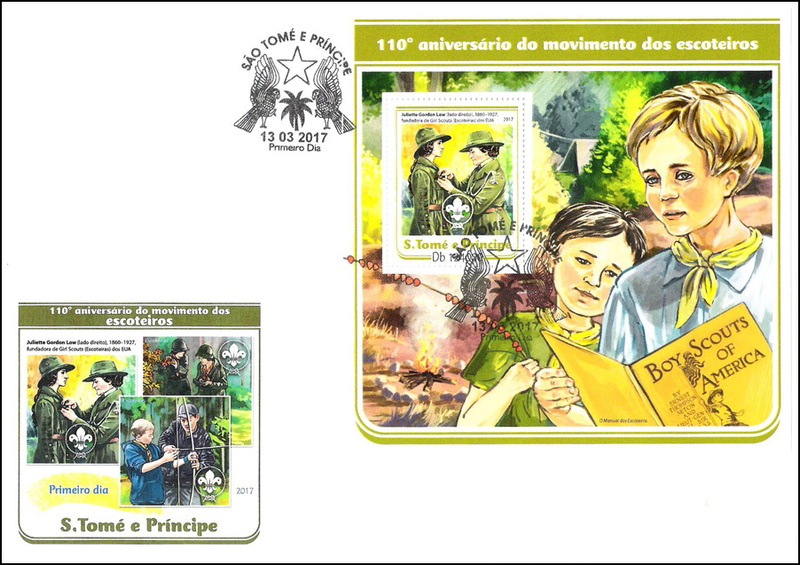 MS of 4 and SS (perf & imperf) for the 160th anniversary of B-P's birth. 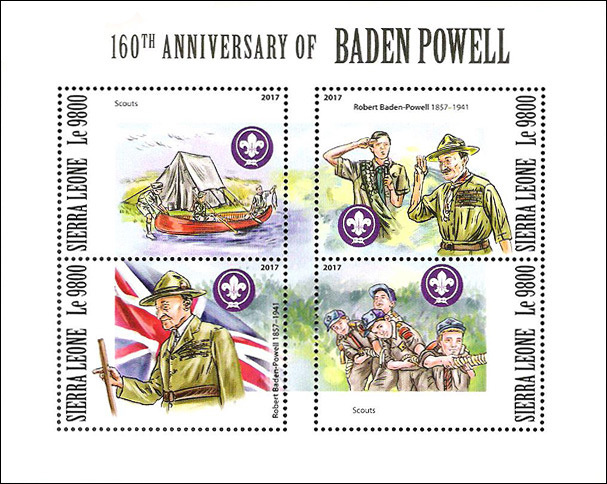 Stamps in MS show B-P with stave with English flag, B-P and Scout saluting, Scouts in tug of war and canoeists at campsite. 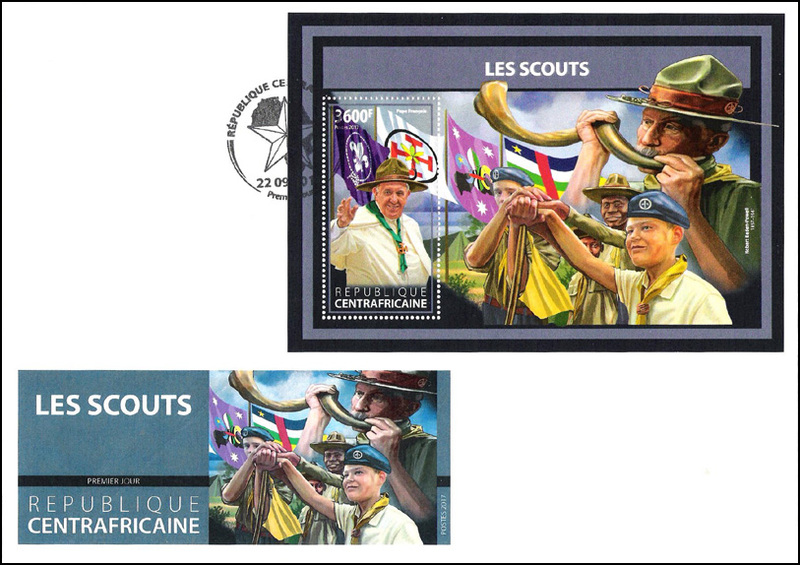 The SS shows B-P in military uniform with Scout saluting and Scout band members in selvage. 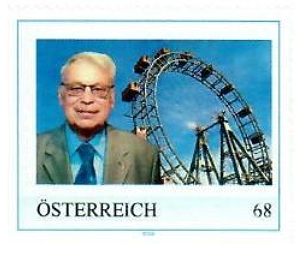 Gerhard Winter, the long-time guildmaster (Chairman) of Osterreichische Pfadvinder Briefmarken Sammler Gilde (OPBSG) in Austria is pictured on a personalized stamp with a ferris wheel in the background. 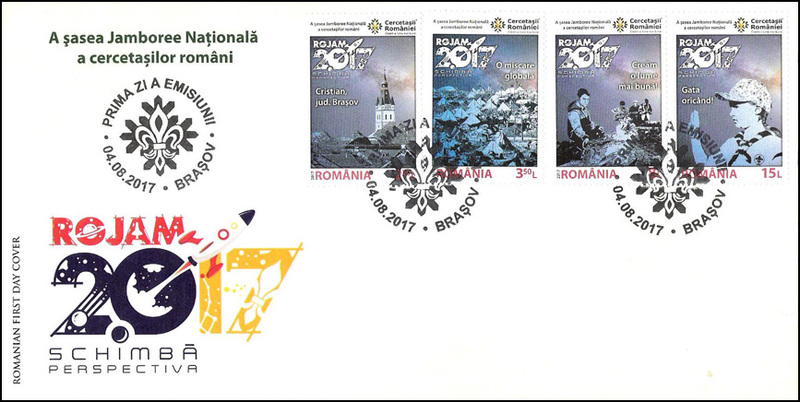 This stamp was done by a group called Meine Marke Personalized Stamps on Tour. 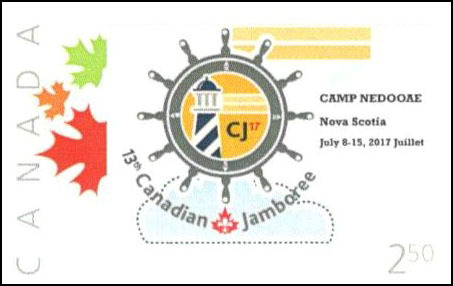 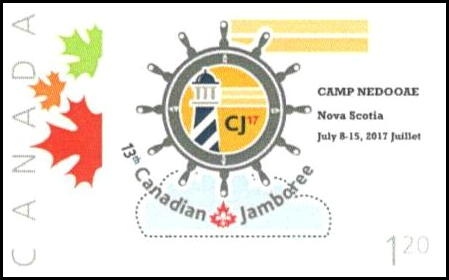 Five "P" stamps were issued in conjunction with the Canadian Jamboree CJ'17, held from 8 - 15 July 2017 at Camp Nedooae, Elderbank, Nova Scotia. 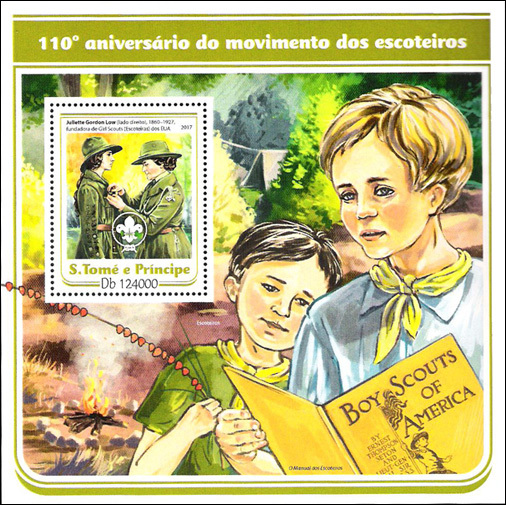 One stamp features the Camp Crest and was valid for Domestic "P" rate only. 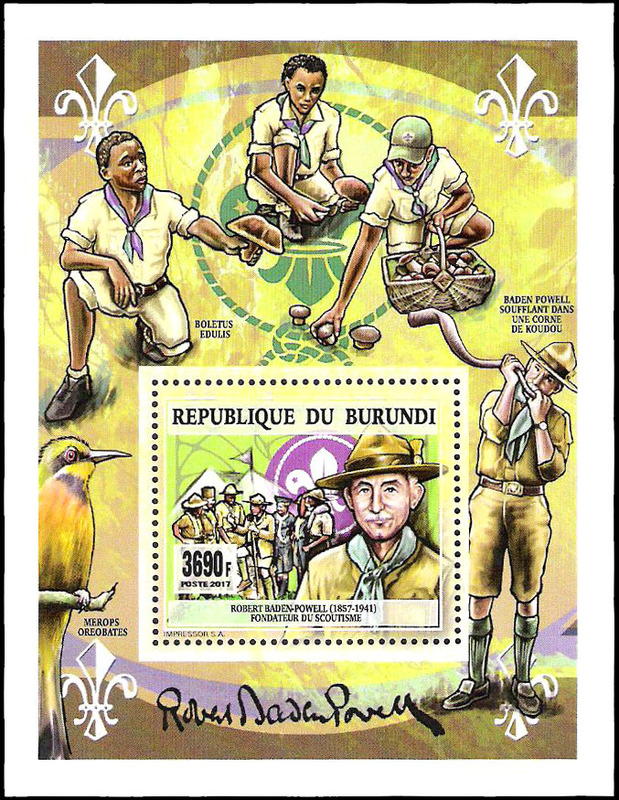 A second stamp depicts the Camp Mascot "Puffy" and was valid also only for the Domestic rate. 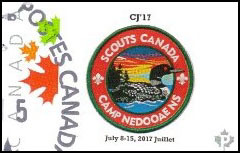 Three additional stamps were issued depicting the CJ'17 logo. 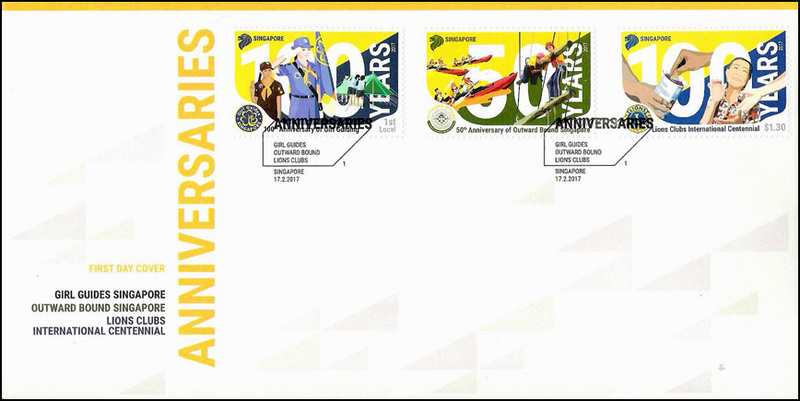 The stamps are identical except for the postal rate. 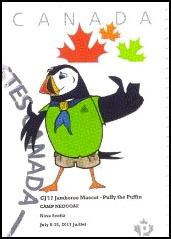 The three different rates are: Domestic "P" rate valid for mail within Canada only; the U.S.A. rate ($1.20) valid for standard first class mail to the United States; and the International rate ($2.50) valid for standard first class mail internationally. 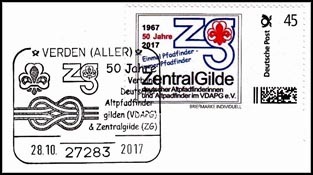 A set of three "P" stamps were issued for the 50th anniversary of the German Old Scouts and the "Central Guild" celebrated at Sachsenhain near Verden (Bremen area) from 27 - 31 October 2017. 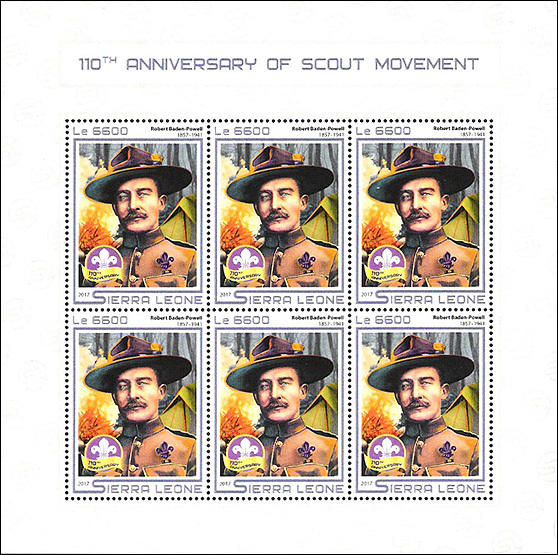 One 70 cent stamp (letter rate) shows the reef (square) knot, the fleur de lis and the years of existence. 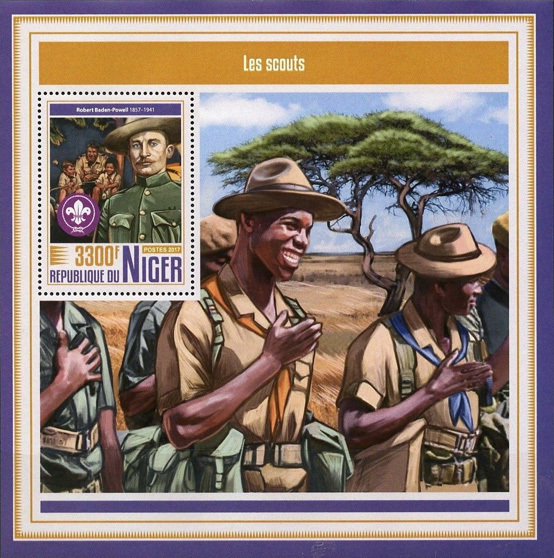 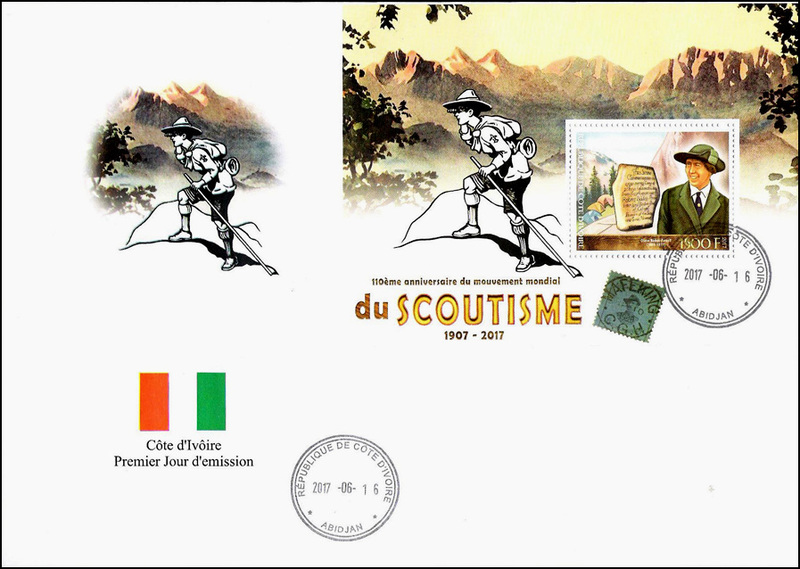 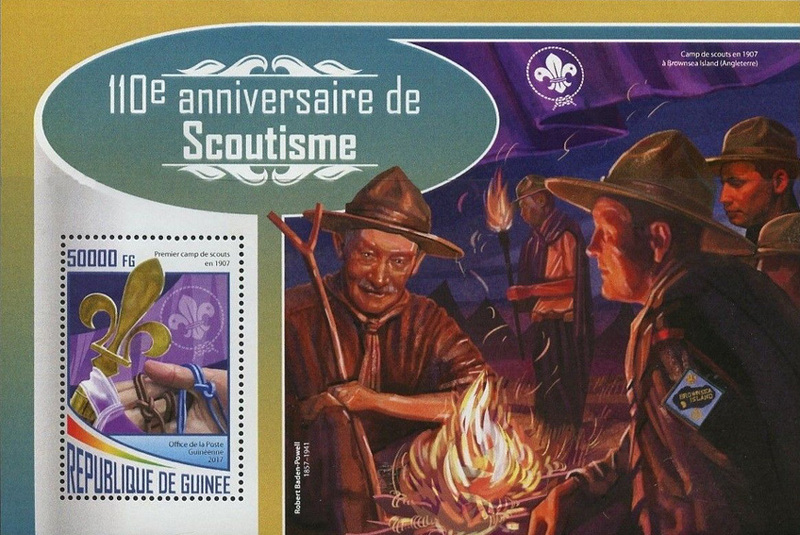 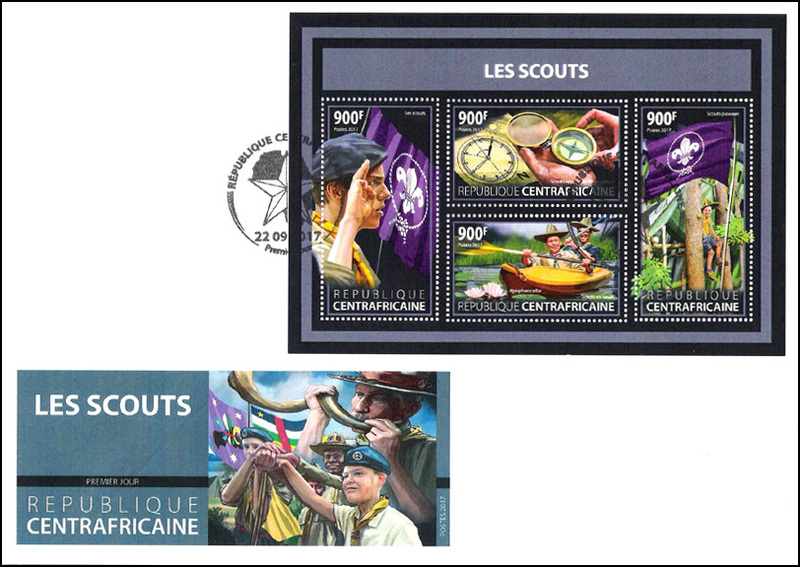 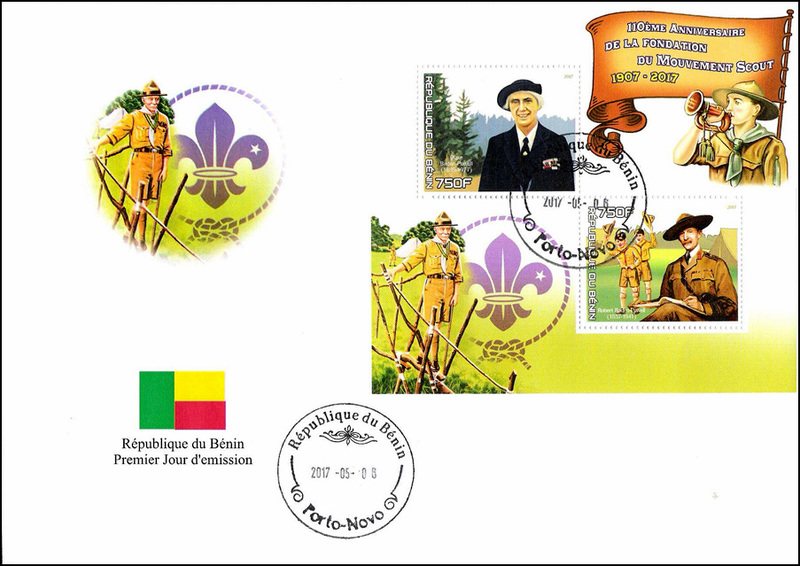 The other two stamps, the 45 cent (post card) and 70 cent (letter) show the emblem of the "Central Guild," the international fleur de lis of the Old Scouts and the slogan, "Once a Scout, always a Scout." 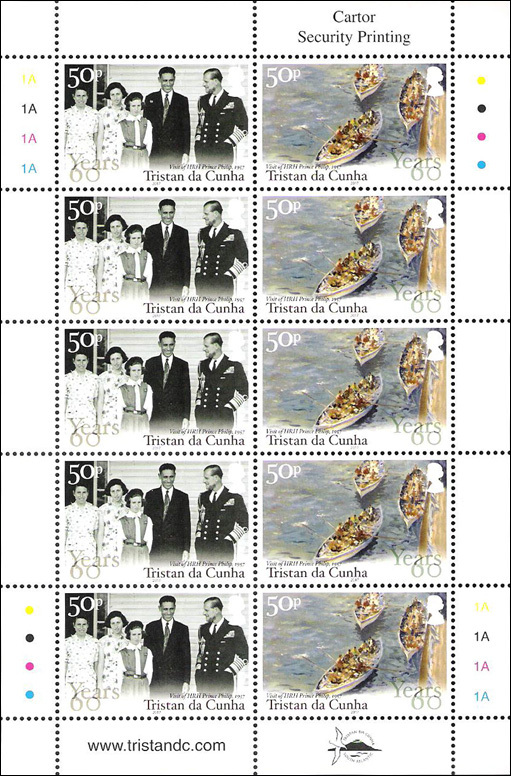 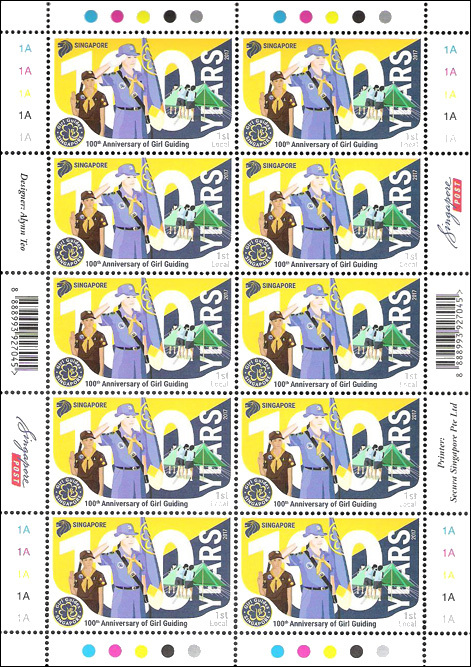 The stamps were printed in blocks of 10. 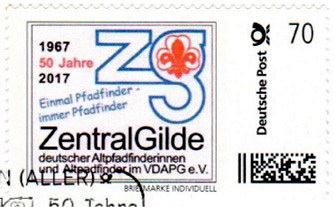 The special cancel is shown on the 45-cent stamp. 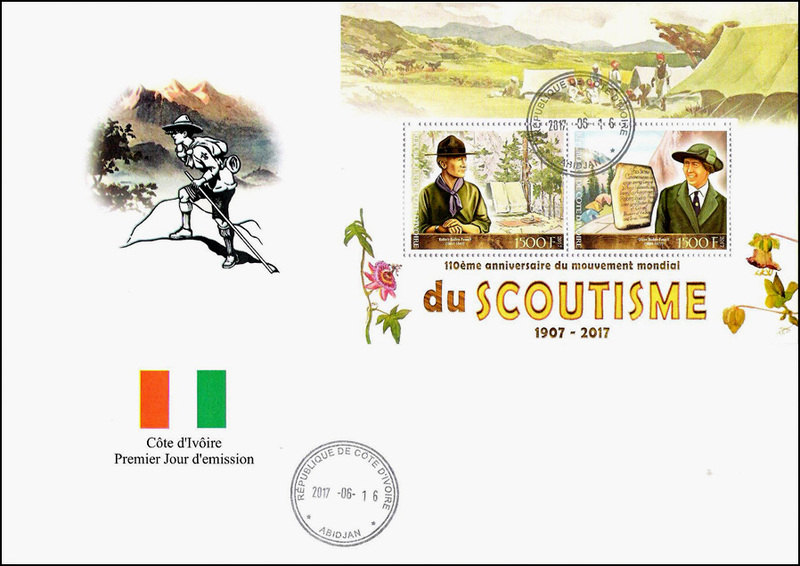 4 stamps were issued for the 15th World Scout Moot in Iceland at the Ulfljotsvatn Outdoor and Scout Center 70 km from Reykjavik, 25 July - 2 August 2017. 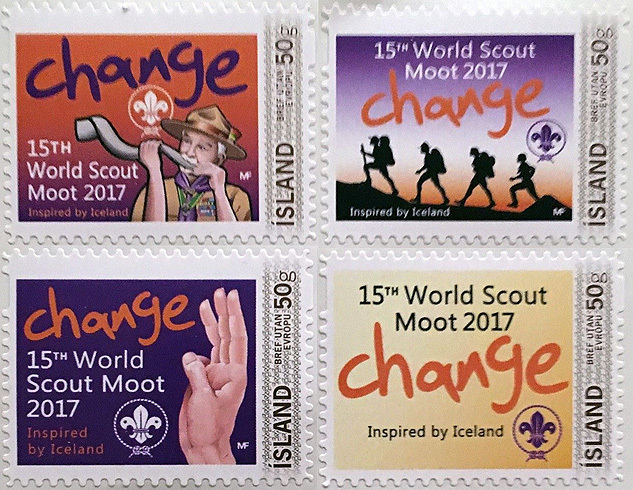 The theme of the Moot was CHANGE, Inspired by Iceland. 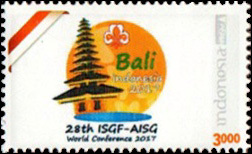 Stamp issued for the 28th ISGF-AISG World Conference held at Denpassar, Bali, 9 - 14 October 2017. 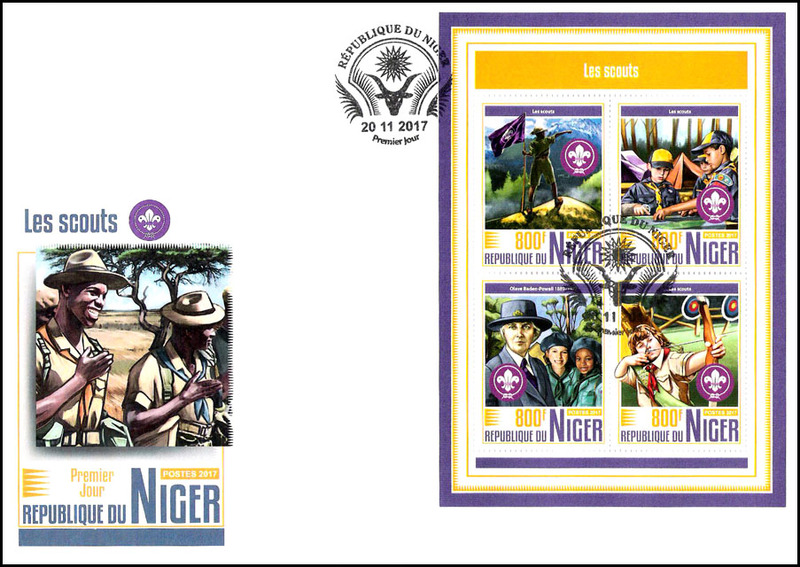 ISGF-AISG (International Scout and Guide Fellowship - Amitie Internationale Scoute et Guide) is worldwide organization for adults in support of Scouting and Guiding. 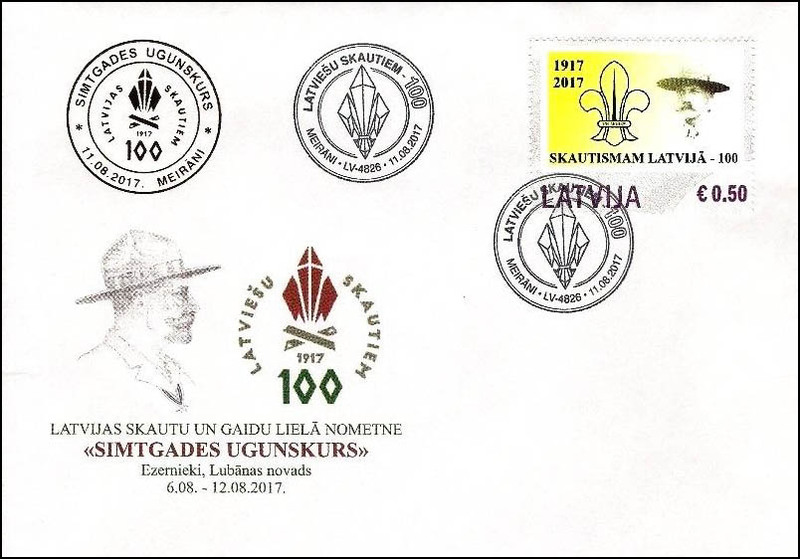 Several "P" stamps were issued in 2017 for the 100th anniversary of Scouting in Latvia. 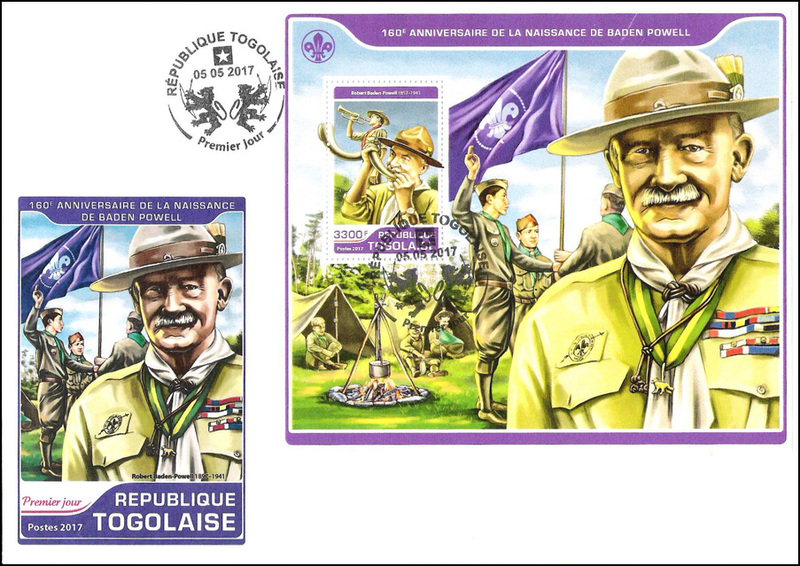 Two of the stamps depict General Karlis Goppers, founder and president of the Latvian Scout and Guides Central organization. 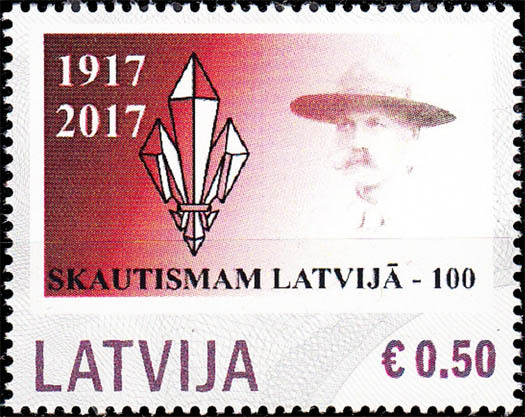 He was a Latvian Army division commander from 1924 to 1934 when he retired. 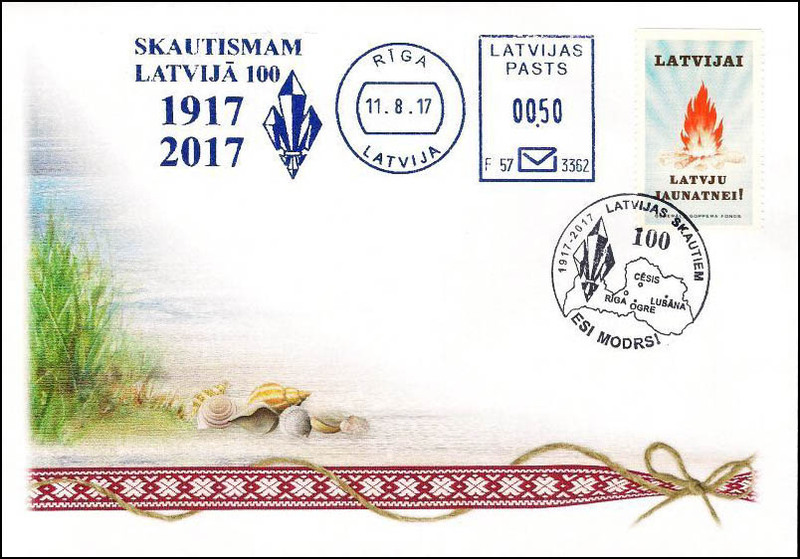 After the Soviet Union occupied Latvia in 1940, the NKVD arrested General Goppers on 30 September 1940 and he was shot on 25 March 1941. 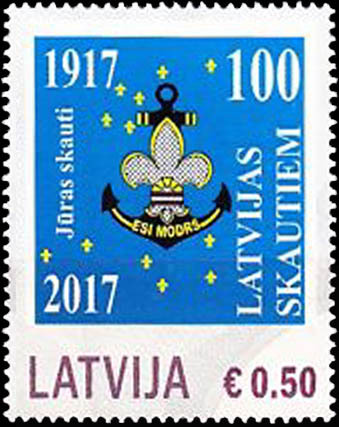 Included in the group of stamps is one honoring the Latvian Air Scouts and one for the Sea Scouts plus one on a cover. 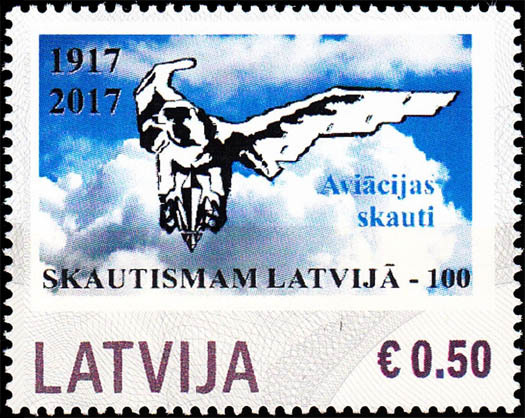 Also, an image is shown of one stamp with an "error," the "T" in the vertical "Latvijas" is missing. 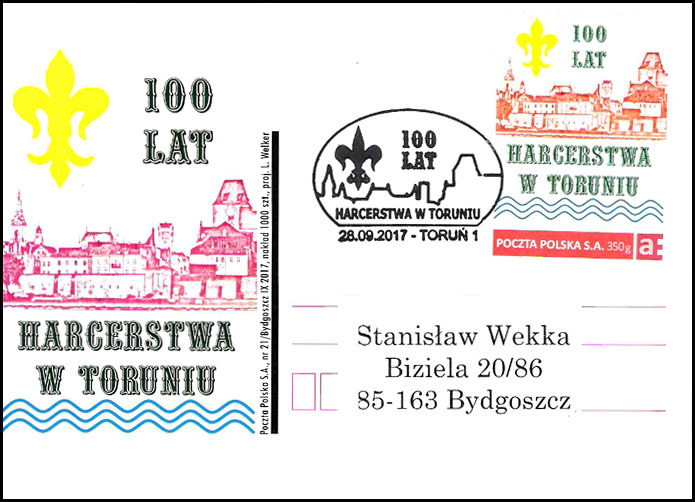 On 20 September 2017, a "P" stamp was issued at Torun for 100 years of Scouting in Torun. 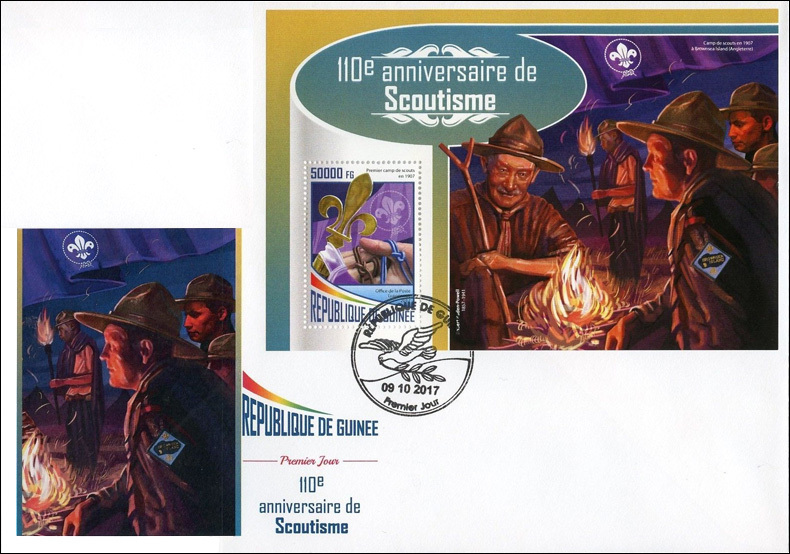 The design includes a view of Old Torun, waves of Vistula River and yellow Scout lily (badge). 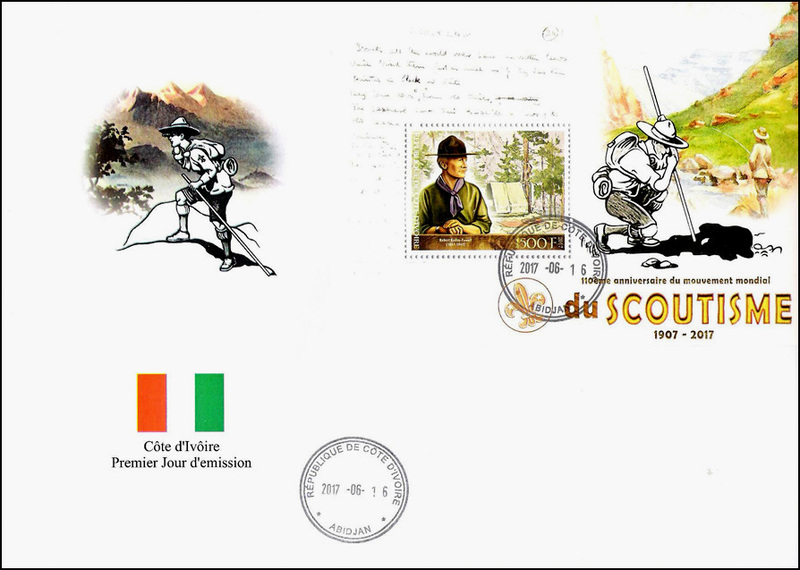 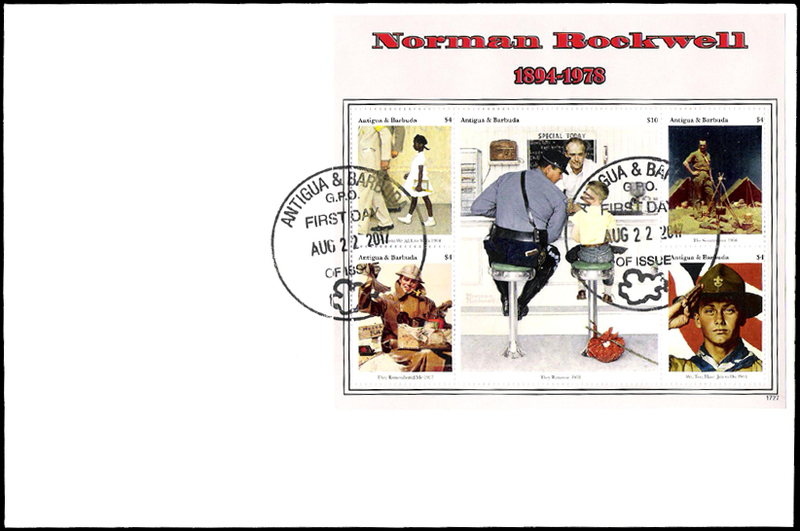 The cachet on the post card is identical to the stamp.